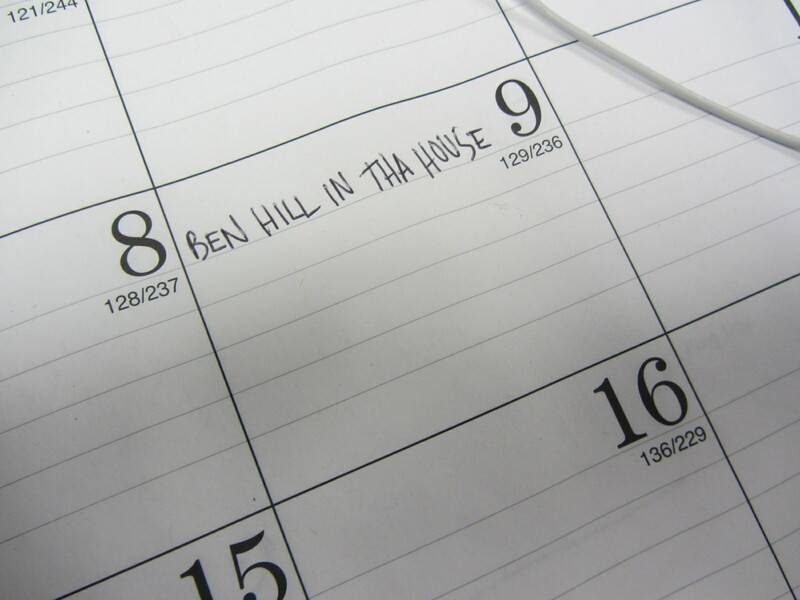 It’s promo scheduling unveiling season — or p.s.u.s. for the acronymically inclined — meaning that teams across the land are announcing buzzworthy theme nights at a rapid clip. 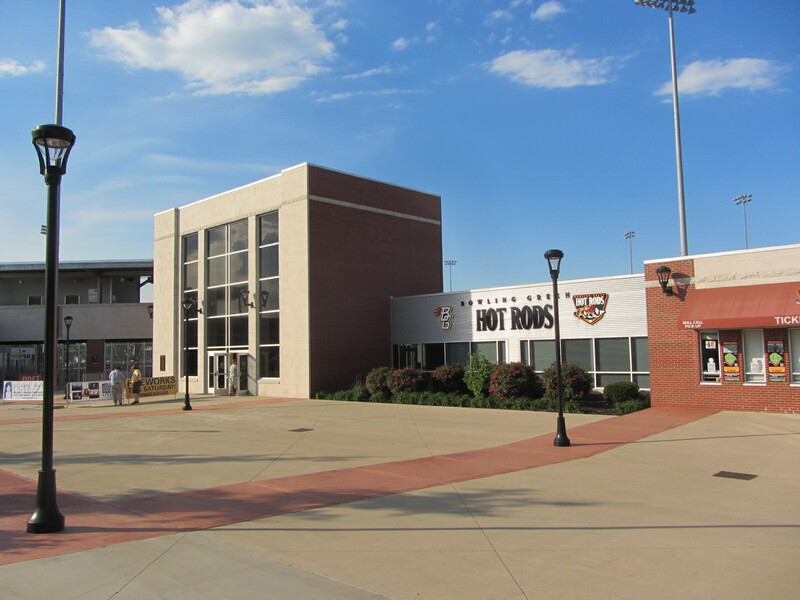 But the most literally buzzworthy is that which was announced by the Bowling Green Hot Rods on Wednesday. As a longtime aficionado of whisky, barrels (my Mom’s maiden name is Cooper) and the covert production and distribution of illicit goods, I’m a big fan of the Hot Rods’ “Bootleggers” promo. Especially because there are already visual elements. No one gets excited by text-only promotion announcements, much like no one is excited by reading the words in this blog post that appear between the images. Images like this. Let there be merch! In short, “Bowling Green Bootleggers” equal bats, beards, buttons, boots, bourbon and barrels. Just watch what you’re doing with your right hand there, Mr. Moonshiner sir. An idea brought on by past and present members of the Bowling Green staff, Bootlegger Night will serve as a tribute to the “Hot Rod” aiding the bootlegging industry over a century ago as a way to outrun law enforcement. 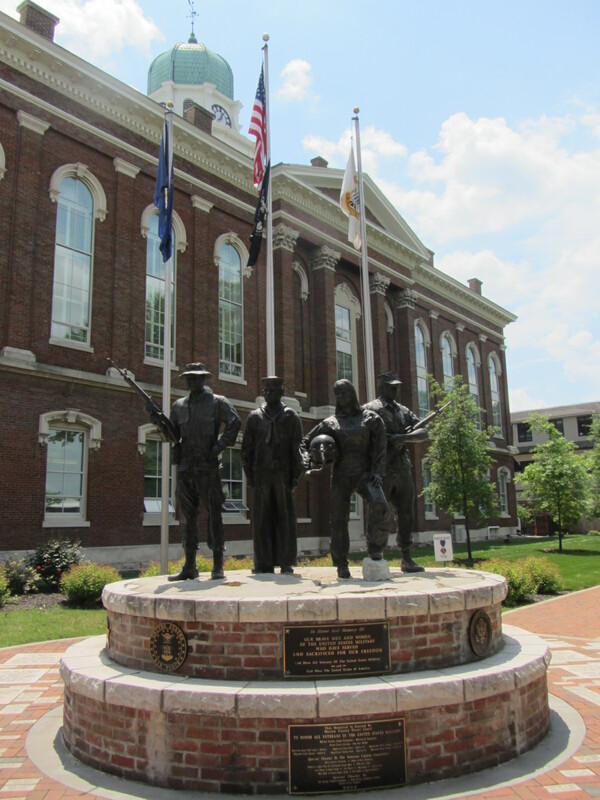 This rich bourbon heritage has since become synonymous with Kentucky, with over 35 distilleries present throughout the state. 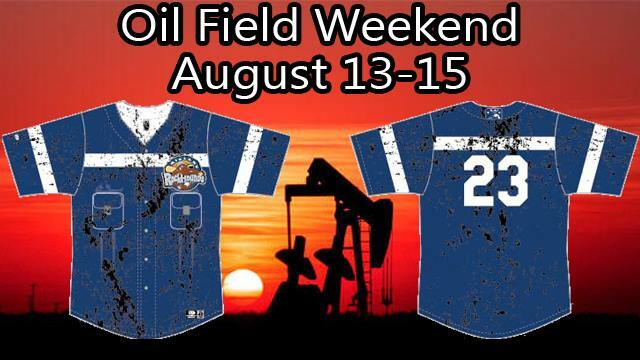 As fans will be greeted by a special “Mason Jar Giveaway” when they enter the gates, the Hot Rods will wear customized hats and specialty jerseys styled after a bourbon barrel….In addition to the customized apparel, fans will also have the opportunity to pre-order two packages featuring personalized memorabilia from the night. 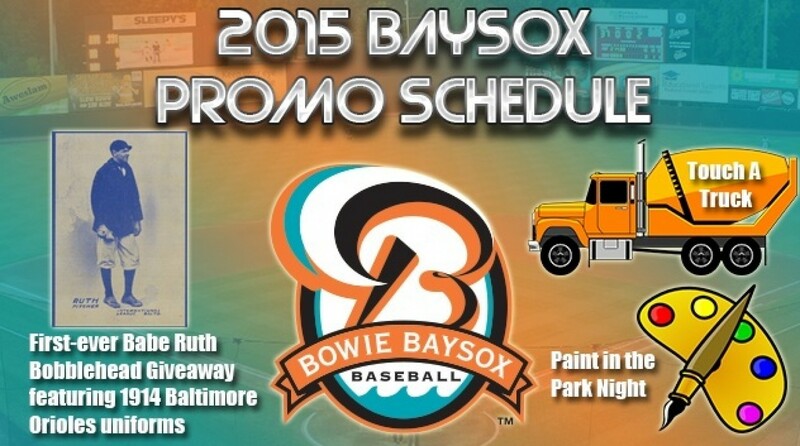 Prior to unveiling this promo yesterday, the Hot Rods tweeted that it would, possibly, be 2016’s best promo. Time will tell. 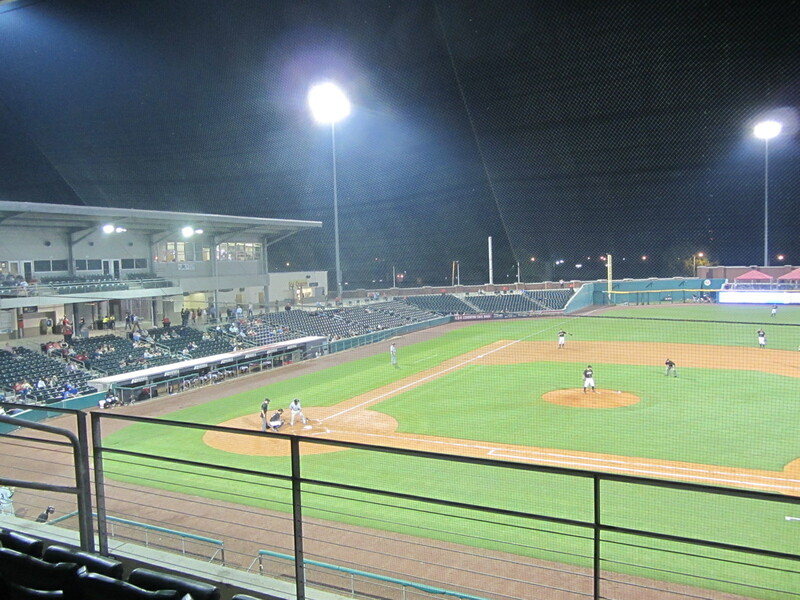 For now, it’s worth noting that, in their inaugural season of 2009, the Hot Rods won MiLB.com’s “Promo of the Year” for “What Could’ve Been Night.” On that evening — the first “What Could’ve Been Night” in Minor League Baseball history — the team suited up as the Cave Shrimp. 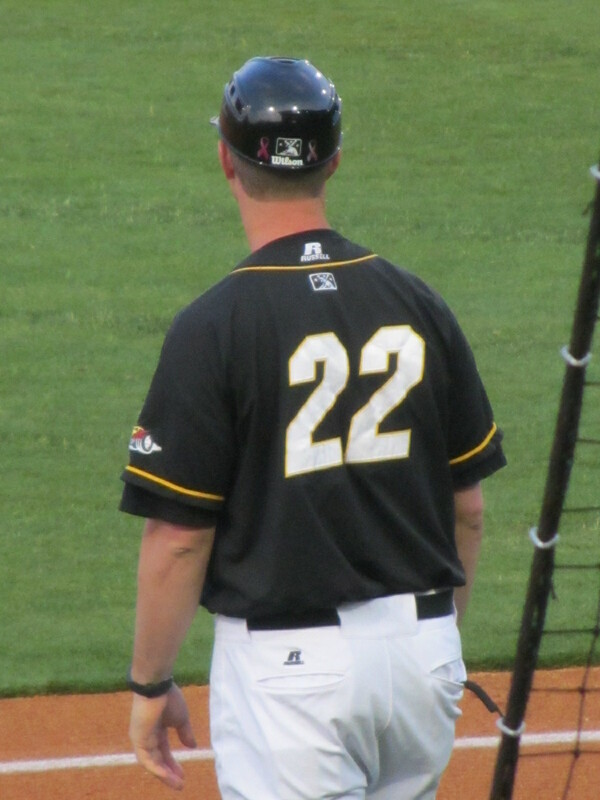 “Cave Shrimp” was one of the finalists in the Hot Rods’ 2008 “Name the Team” contest. Bootleggers was not. 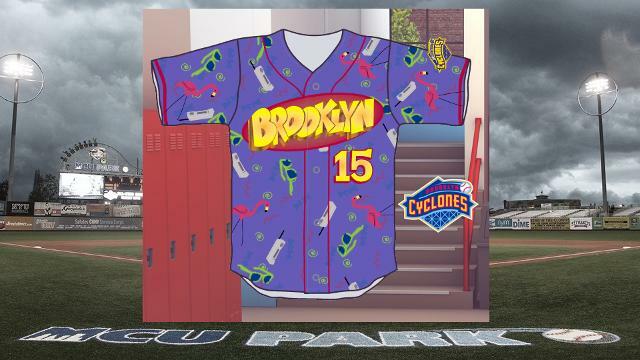 So, in effect, Bootleggers never “could’ve been.” But yet, here we are: Bootleggers soon will be, resulting in the first”What Could’ve Been ‘What Could’ve Been’ Night” in Minor League Baseball history. Life is weird. 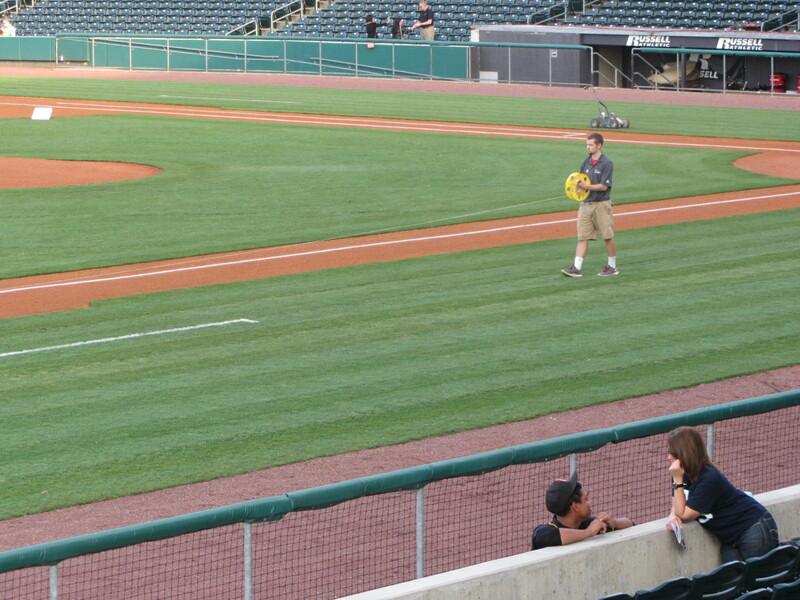 Minor League Baseball is weird. I’m weird. You’re weird. Drink whisky. The use of Native American imagery within the world of sports is a controversial topic, as teams like the Cleveland Indians and (especially) the Washington Redskins are under increasing pressure to abandon names and/or logos seen as culturally insensitive. 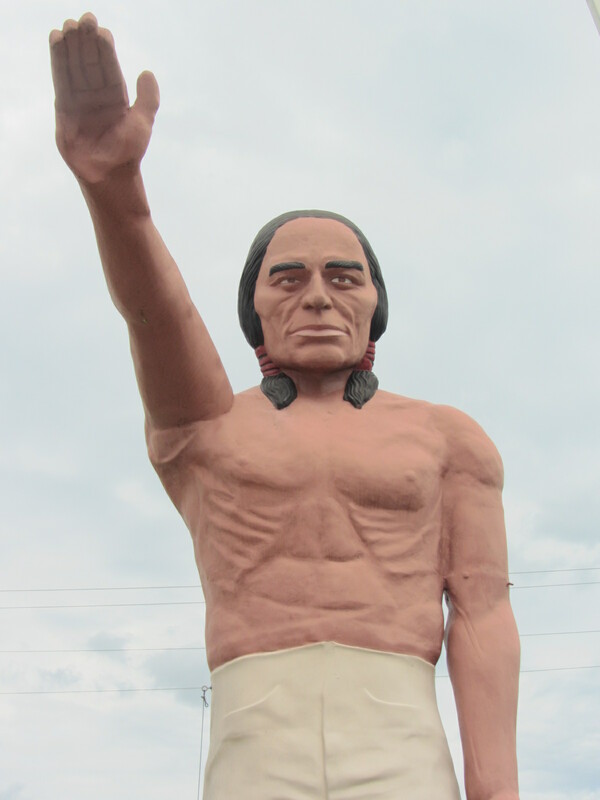 But the Spokane Indians have found a way around this problem, collaborating with the local Spokane tribe to adopt a look that celebrates, rather than denigrates, the people it purports to represent. 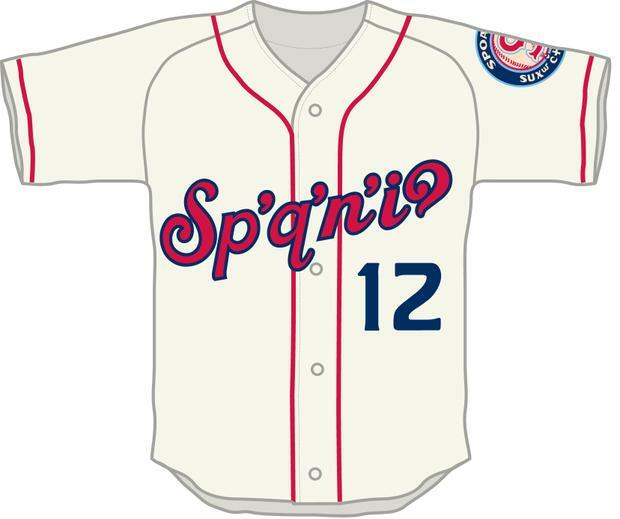 This season, the club will wear a jersey in which “Spokane” is written in Salish script. The collaboration between the Spokane Indians and the Salish tribe is nothing new, but the above jersey represents a significant development. 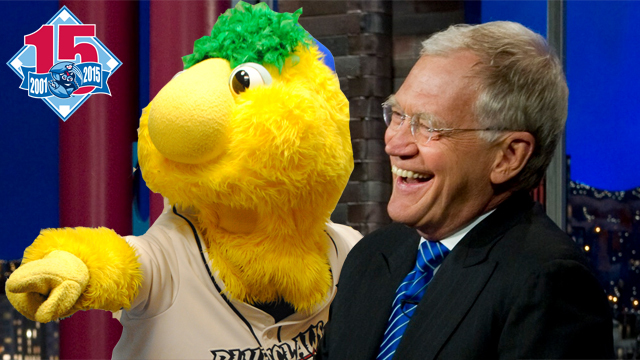 In fact, this partnership will be the topic of my next Minoring in Business article, running on MiLB.com tomorrow. Stay tuned! 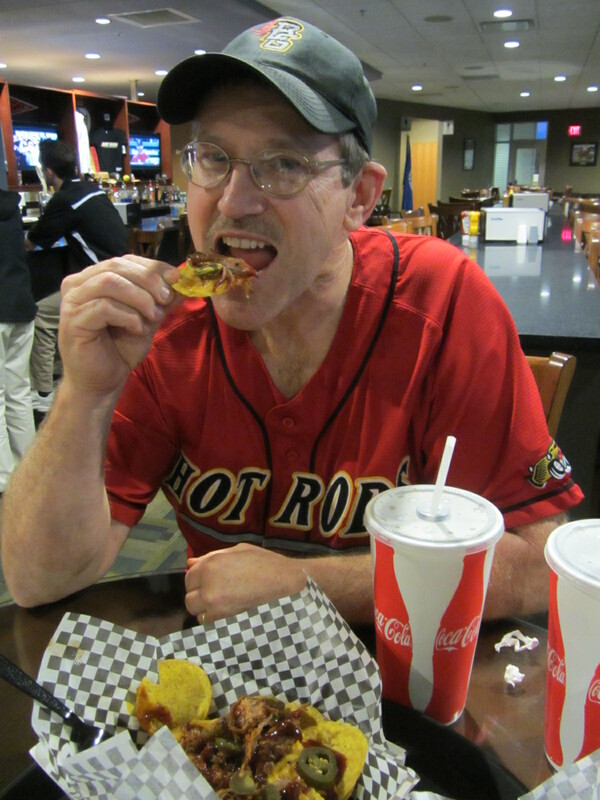 I was curious as to how this promotion was received, and Hot Rods assistant general manager Ben Hemmen satiated my curiosity thusly. 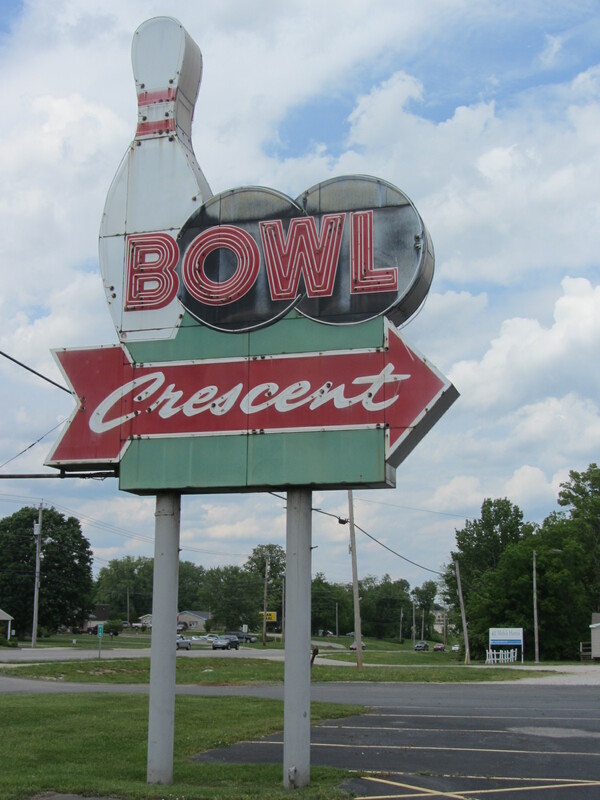 National “Pi” Day was a BIG hit in Bowling Green. 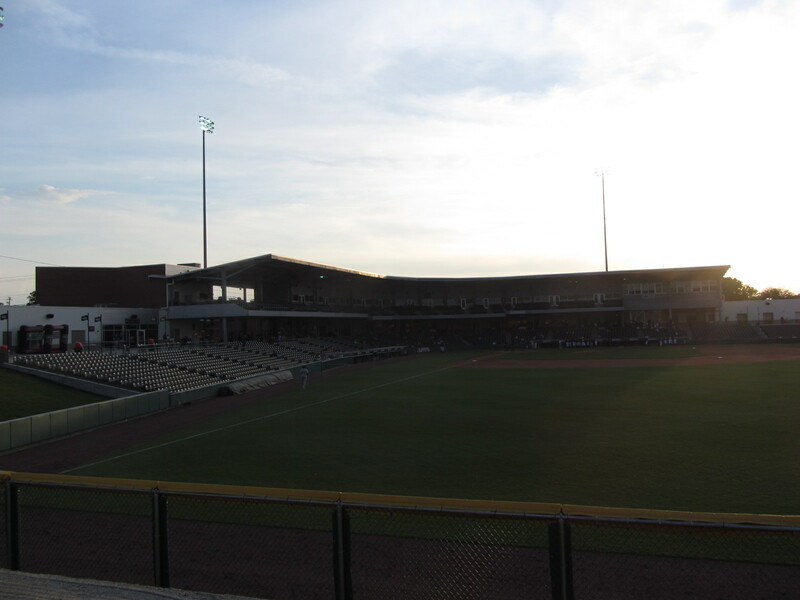 In just three hours and fourteen minutes (3.14), we sold over 600 tickets at the box office or over the phone to games for this upcoming summer. The Power of “Pi” will definitely be something that we look at using next season to tie in a promotional opportunity for our fans. Among the many items on team to-do lists at this time of year is adding new situationally appropriate song selections to the music database. For help with this endeavor, one enterprising rookie-level P.A. announcer took to Reddit. The resulting discussion is well worth reading. This blog is also well worth reading, in my less-than-humble opinion, and I thank you for having Reddit. 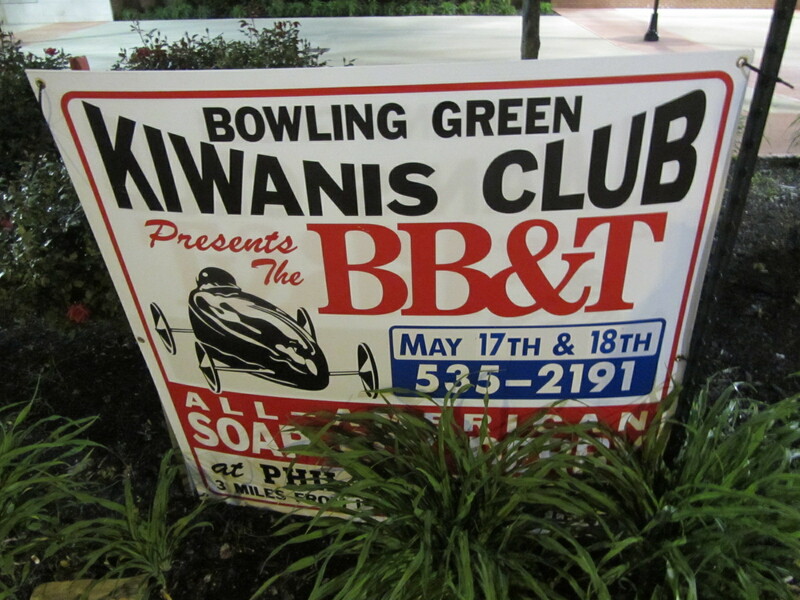 2013’s slate of peregrinations began with May’s Southern Swing trip, with stop #1 being in Bowling Green. 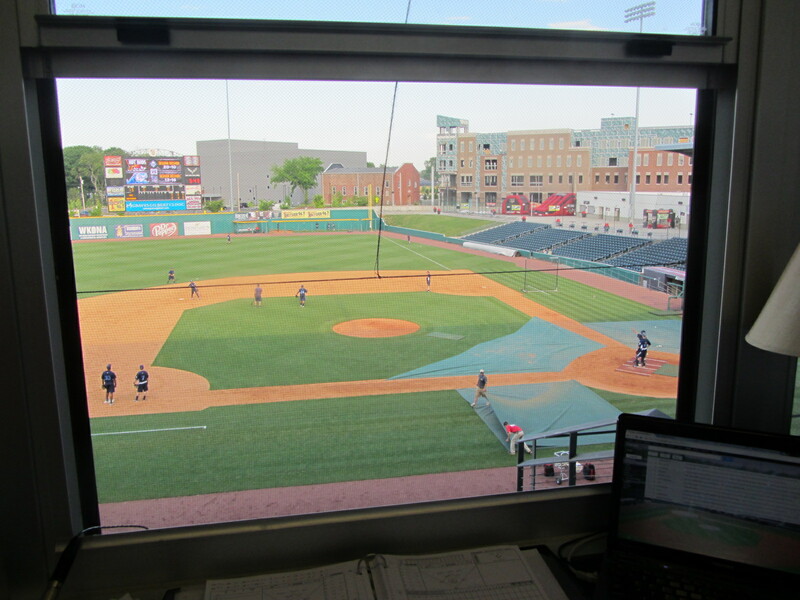 I attended May 8’s Hot Rods game, and the next morning, after recording the first of what would become several dozen “Road Trip Hotel Room Reviews,” I was able to explore Bowling Green’s downtown area (located the proverbial “hop, skip, and a jump” away from the stadium). 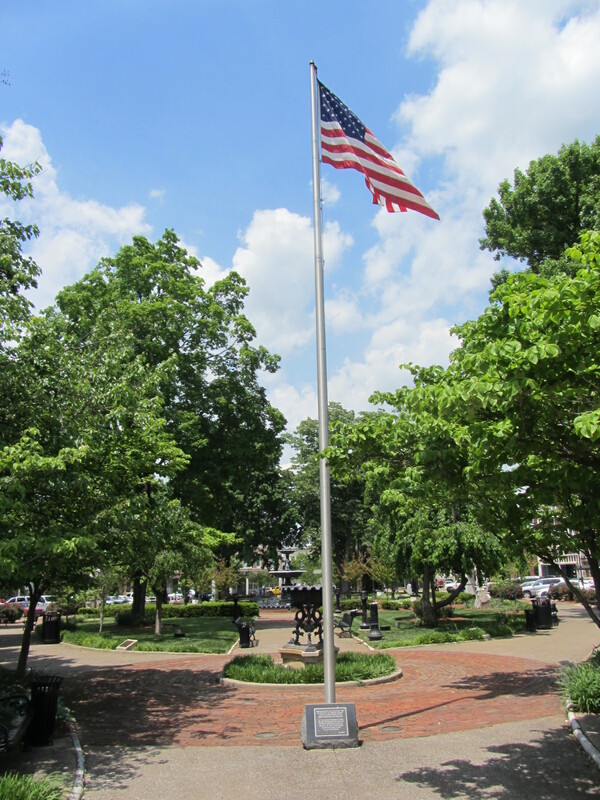 The focal point of downtown is “Fountain Square Park,” which is ripped straight out of Norman Rockwell’s America. 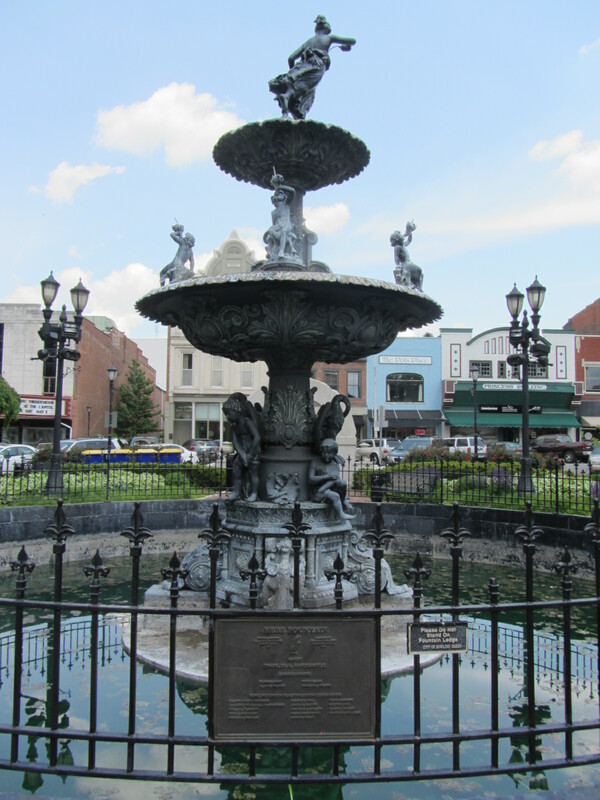 Restored facades of 19th-century buildings, a renovated Art Deco movie theater, thriving businesses and bustling professionals surround the park’s historic fountain, statues, flowers, shrubs, mature trees and benches. 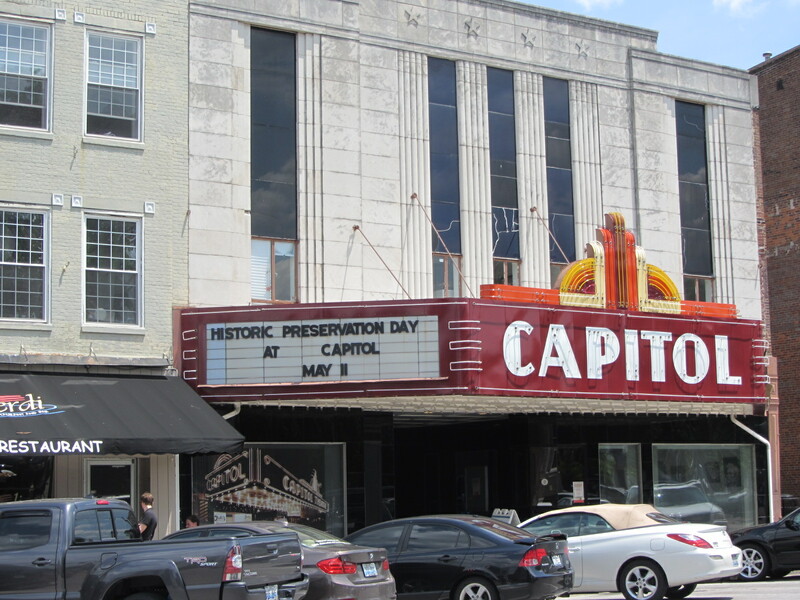 Once the site of prohibitionist marches, trolleys, livestock trades and scrap drives, today it is the host of summer concerts, parades, arts and crafts shows and many other festivals and events throughout the year. 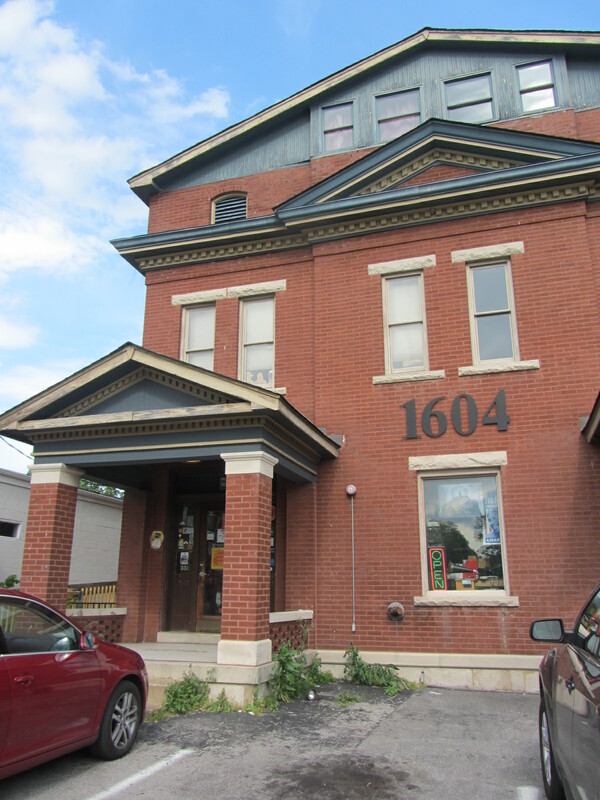 But not all of downtown Bowling Green was as genteel as the images seen above. 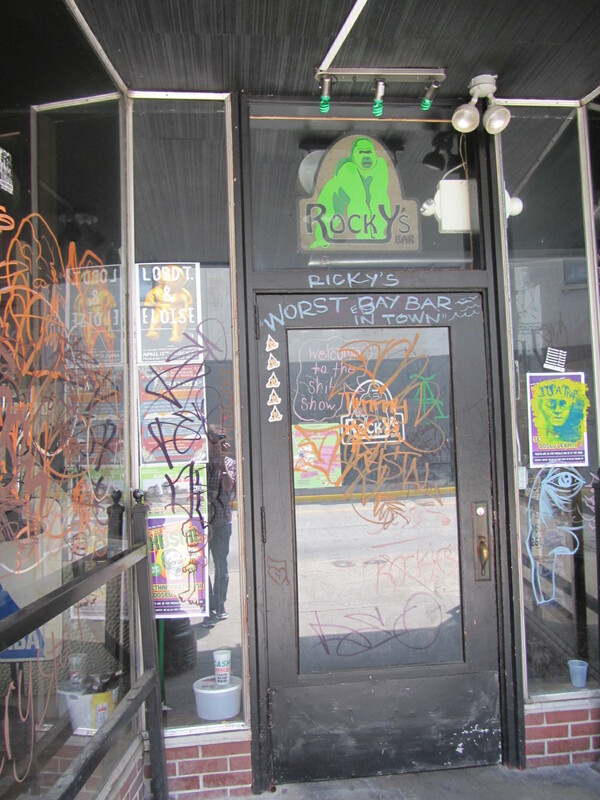 Here’s Rocky’s Bar, located at 322 E. Main Street. Inebriates in the know know to order Gorilla’s Blood. Of course, one of the best things about trips such as these is stopping at kitschy rest stops for gas/food/totally unnecessary and irredeemably tacky but nonetheless irresistible souvenirs. 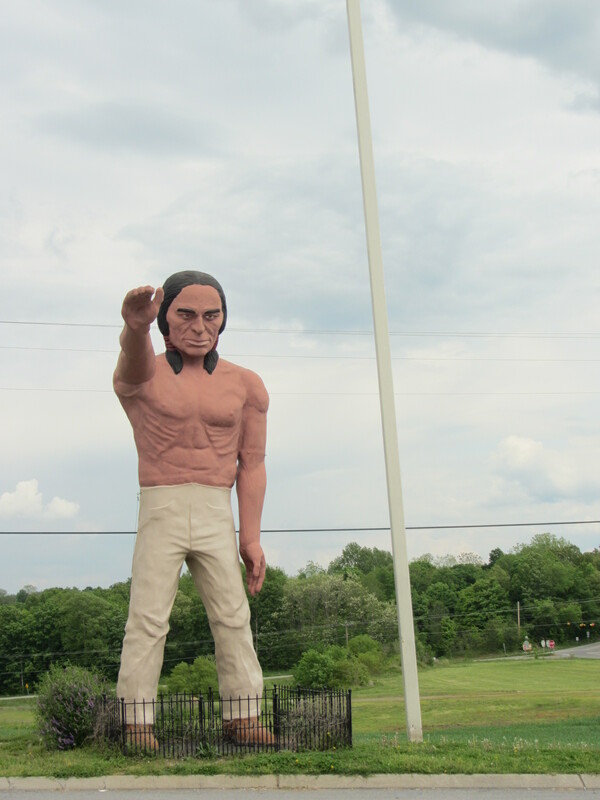 At Sad Sam’s, one is greeted by this statue. It is as vividly rendered as it is culturally insensitive. This guy is a behemoth! 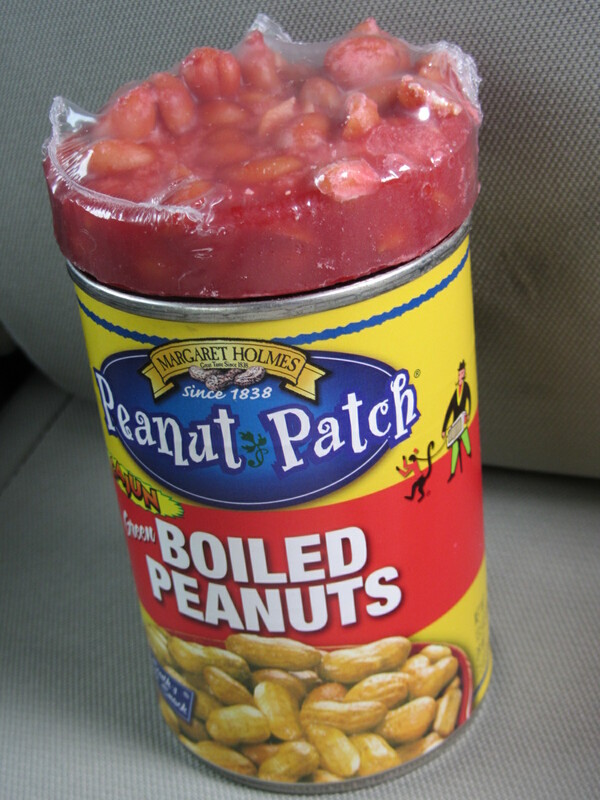 I limited myself to three items while at Sad Sam’s: An “anti-snoring” contraption consisting of a small clothespin in a wooden box (sadly not pictured), a can of boiled peanuts and the bizarrely wax-like peanut patty. 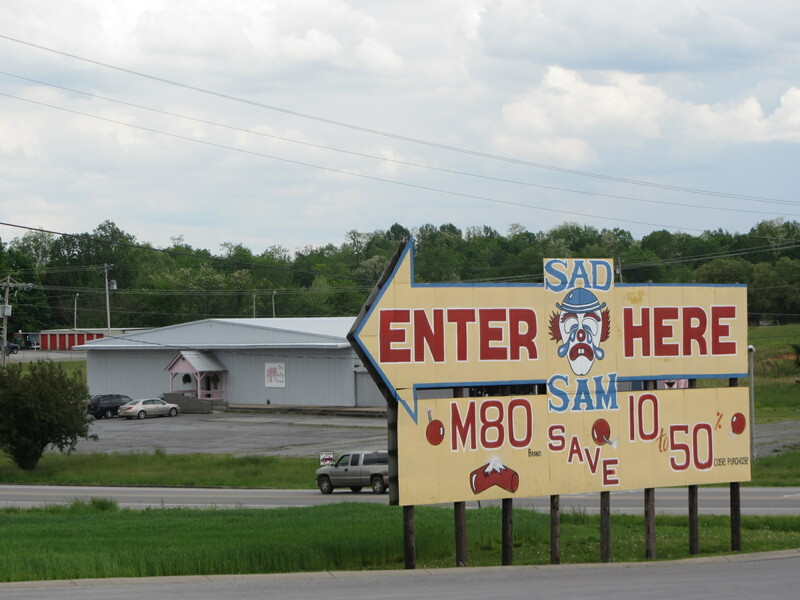 Out in the parking lot of Sad Sam’s an older gentlemen with greased-hair and a pack of Pall Malls in his breast pocket struck up a conversation with me. He was curious as to whether I liked the Kia I was driving (my rental car), and when I replied that it was adequate but unremarkable he told me that he bought an “alien green” Kia for his wife. And with that, it was on to Nashville. En route to Greer Stadium, home of the Sounds, I was able to make a brief detour at Grimey’s. 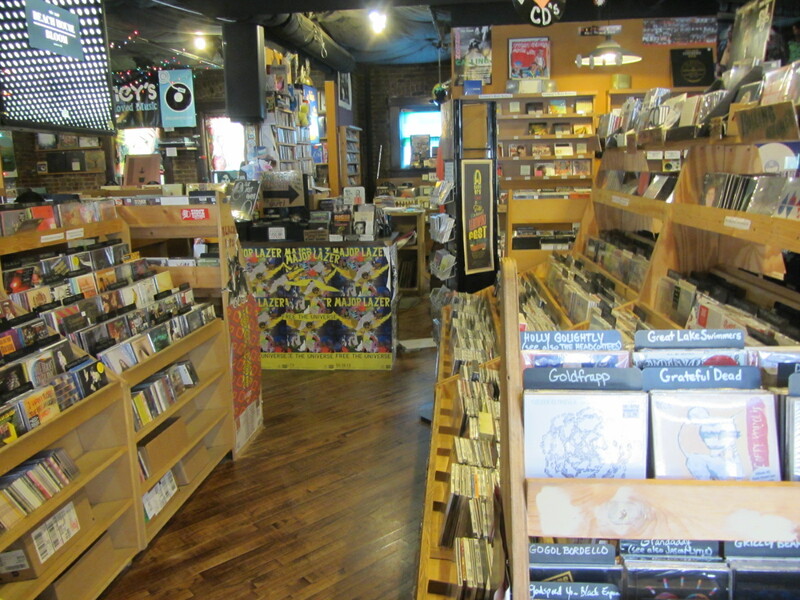 Behind this humble domestic facade lurks one of the best-regarded record stores in the city. 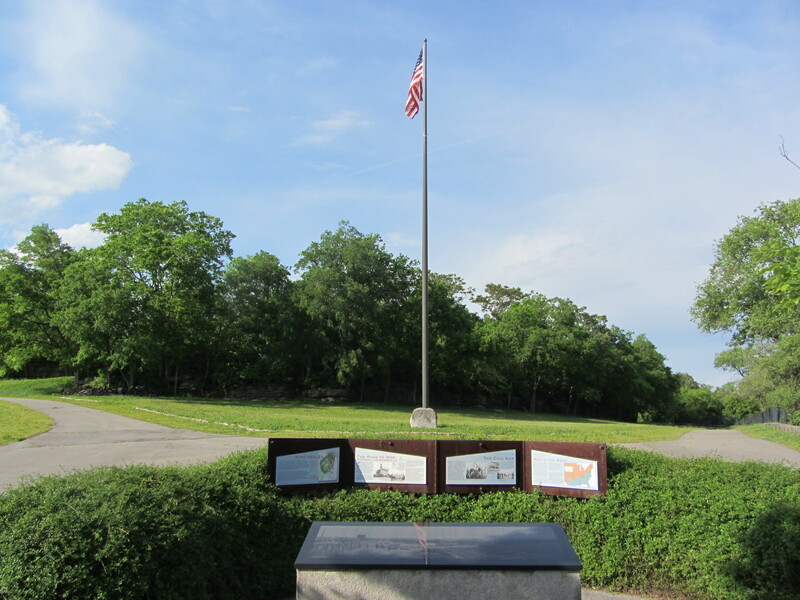 Grimey’s was very close to Greer Stadium, and my next stop was even closer: Fort Negley, a Union fortification built during the Civil War, is located adjacent to the ballpark. 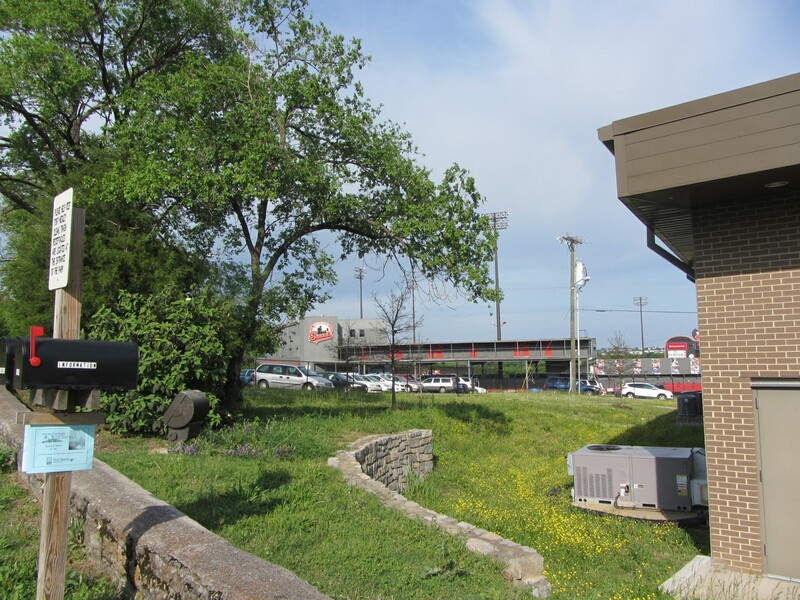 Greer Stadium is actually visible from the base of Fort Negley. 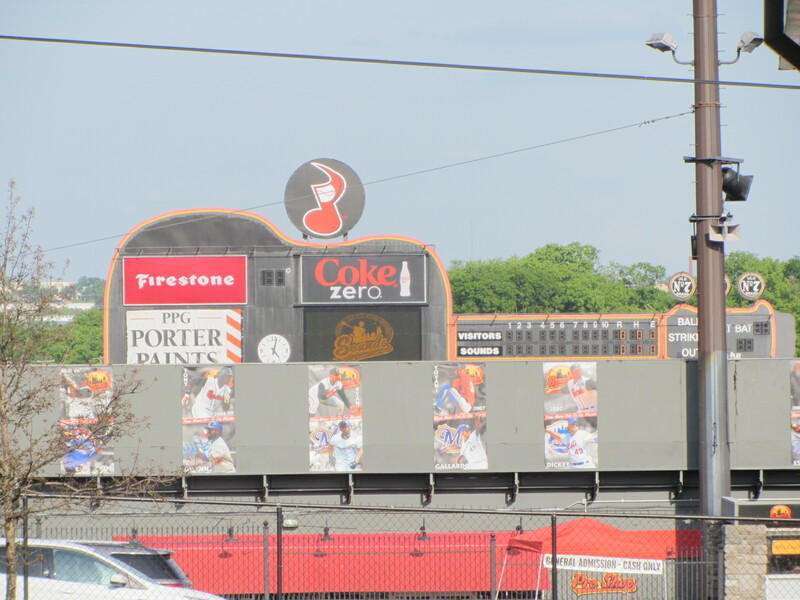 I’m going to go out on a limb and declare this to be the only guitar-shaped scoreboard that is visible from a National Historic Landmark. 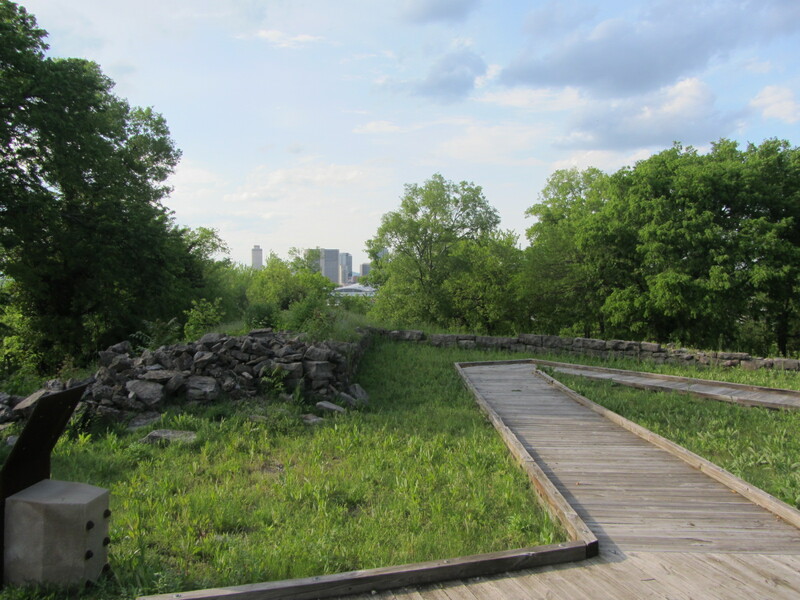 I wandered about the fort for a half hour or so, but unfortunately these are the only photos that have survived my travails. 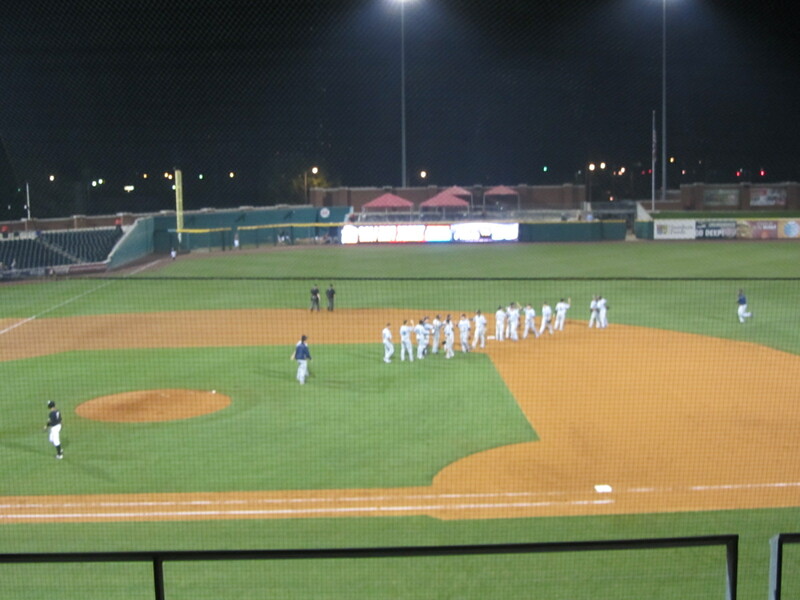 And from there, it was off to the ballgame. 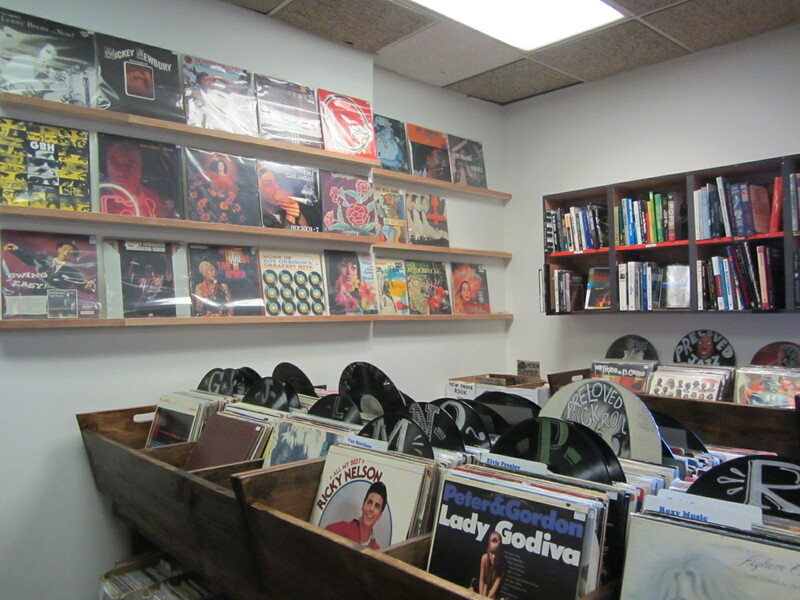 As I noted at the time, the Sounds were expecting me. You can read all about my night with the Sounds by clicking HERE, but as for this particular post this is all I’ve got. 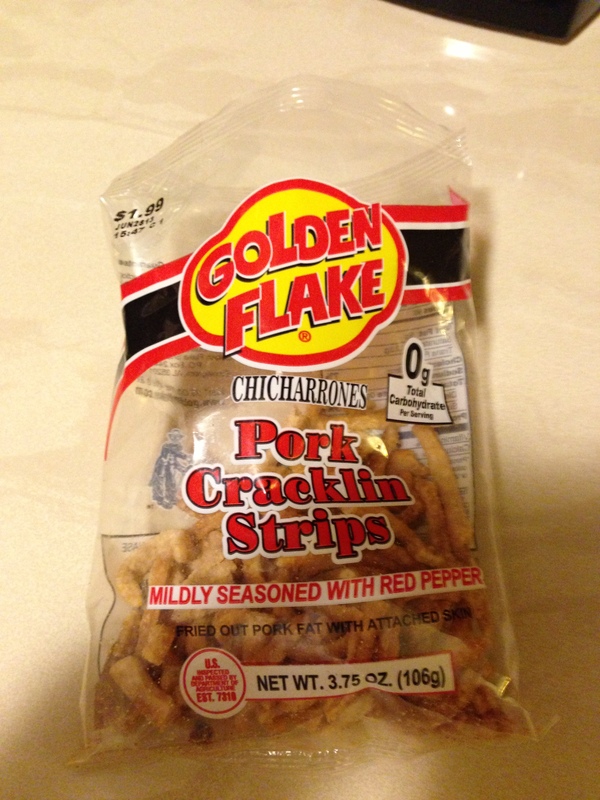 I’ll close by noting that I have a pork cracklin addiction, and had to ration myself to one bag for every day that I was on this road trip. Nothing like pulling a blogging all-nighter in a hotel while eating a bag of Golden Flakes and drinking Mello-Yello! Thanks for “returning to the road” with me. Post #1001 is now complete. 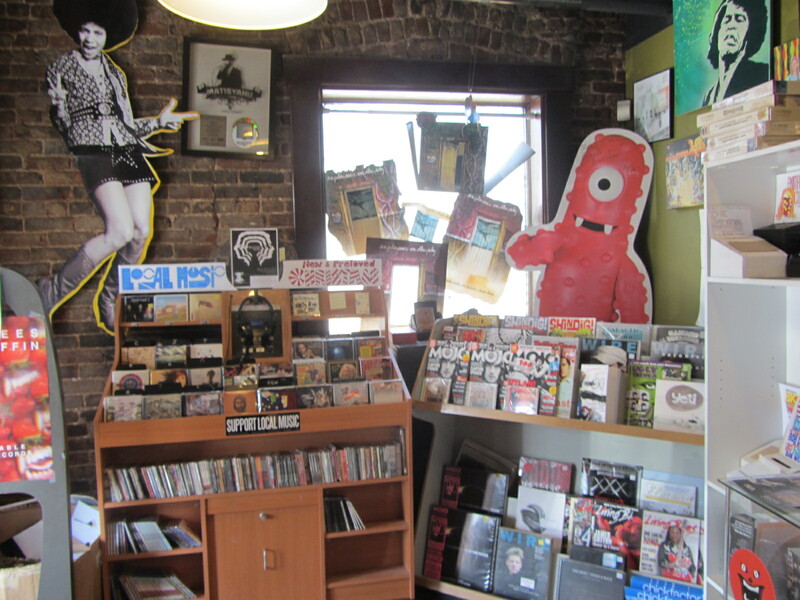 While 2009 included a couple of incidental dilly-dallies, these “On the Road” blog installments began in earnest in 2010. 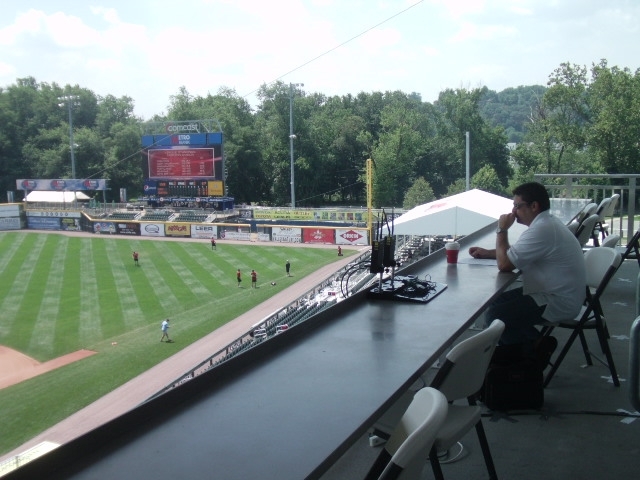 2013, then, marks the fourth season of this on-going adventure, in which I visit Minor League stadiums nationwide and deliver the results of said explorations to you, a reader both discerning and loyal and very attractive. All of this is to say: “Yes, I am on the road again” (quotes utilized because I said this out loud while typing). 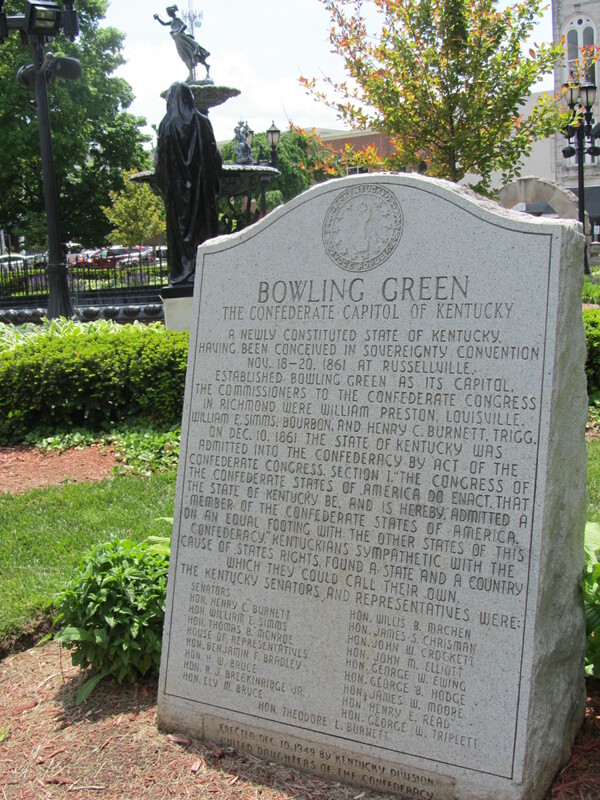 And this year’s travels began in Bowling Green. 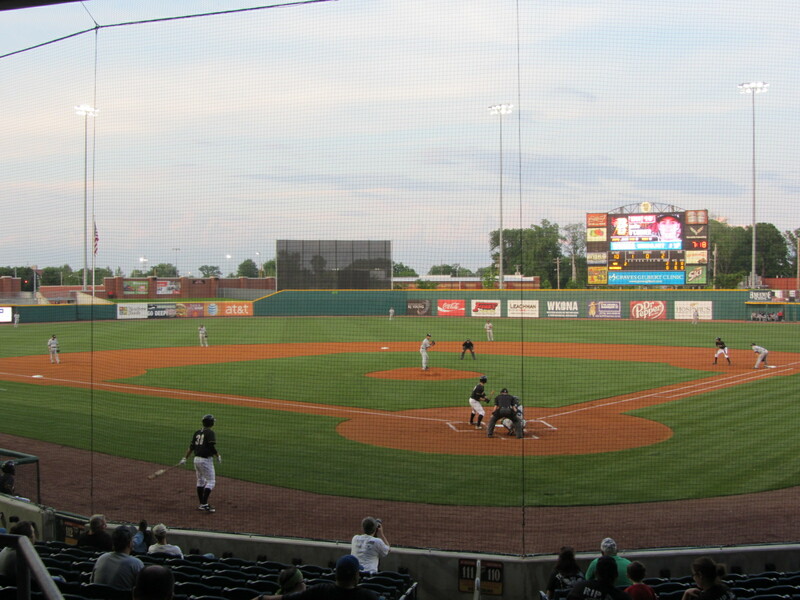 Bowling Green is the home of the Hot Rods, and the Hot Rods play in Bowling Green Ballpark. 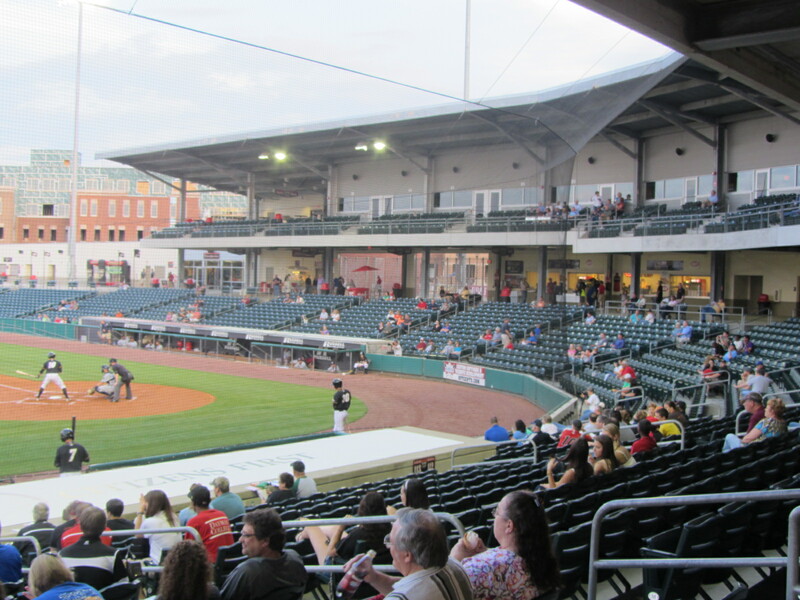 Like many Minor League stadiums that have come before, Bowling Green Ballpark is being utilized as the centerpiece of a downtown revitalization project. 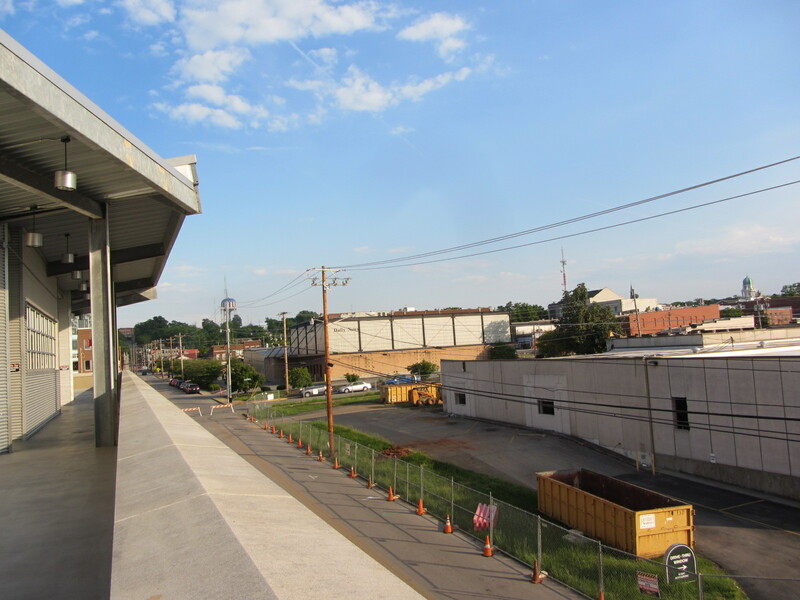 It opened in 2009 — marking the first time that Bowling Green had had professional baseball since 1942 — and four years later new retail, restaurant and residential buildings are springing up around it. 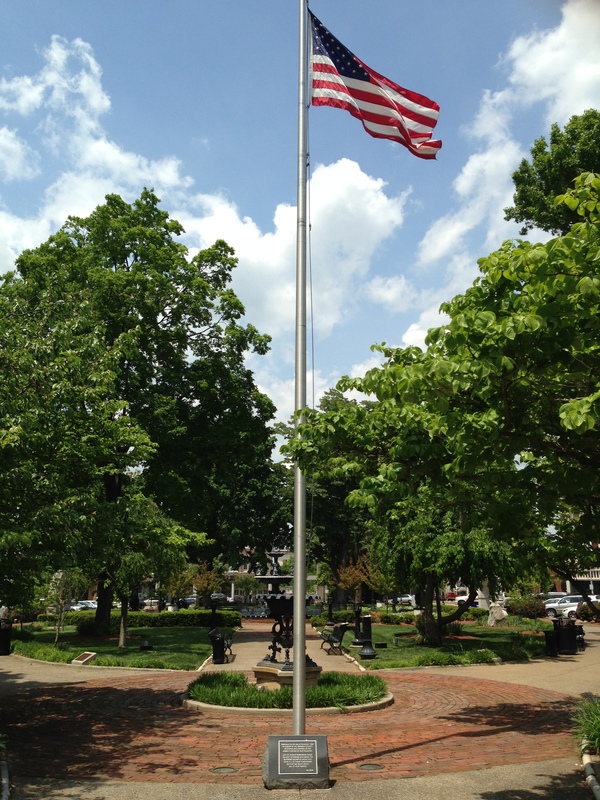 A short walk down the street seen below leads to Bowling Green’s downtown square, a truly picturesque and tranquil old-fashioned retail hub that I visited the next day. But back to the ballpark — more vantage points! And is that what I think it is? 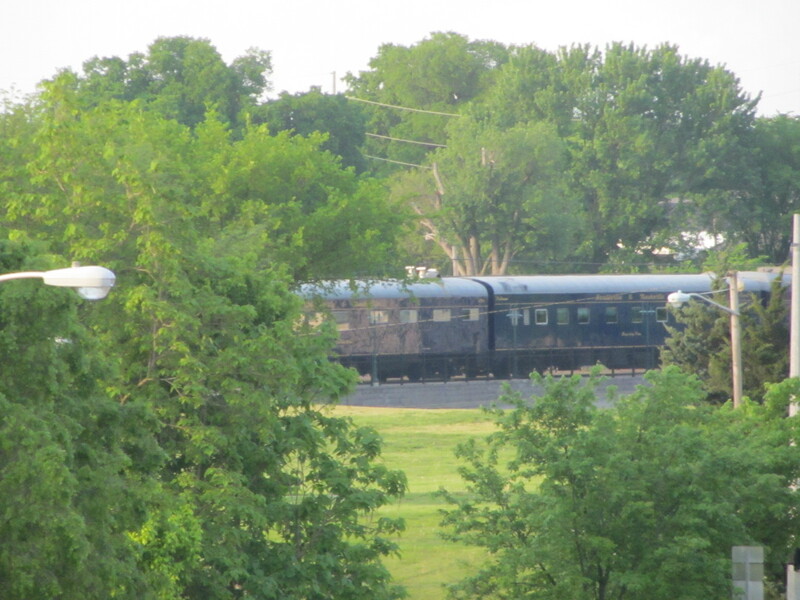 The answer to this question, due to the fact that I know what I’m thinking, is a resounding yes: train tracks! And trains! We’ll return to the Stadium Club in a bit, but for now let’s descend to sea level. 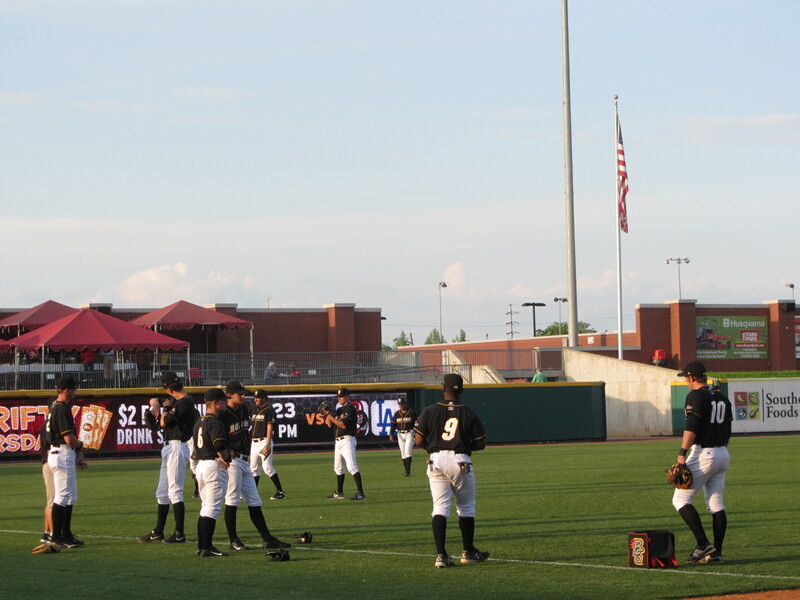 The pre-game sights were similar to that which you’ll find at MiLB parks all over the country. 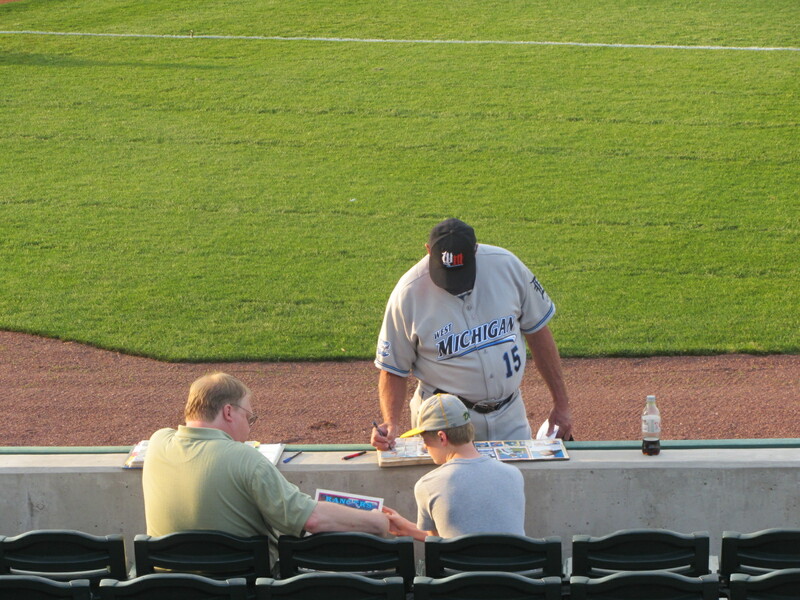 Larry Parrish, big league slugger turned manager of the visiting West Michigan Whitecaps, signing a few autographs. 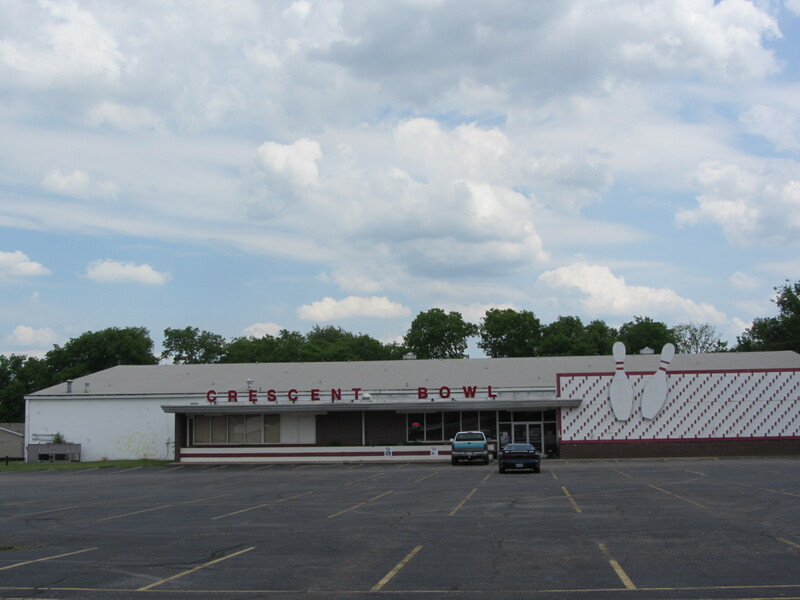 Bowling Green, as you may know, is located fairly close to the natural wonder that is Mammoth Caves. 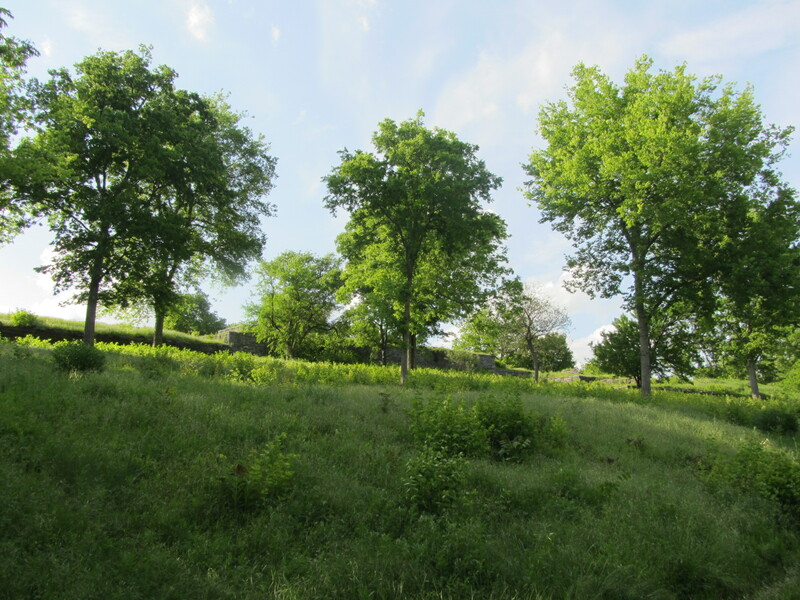 Such topography extends to the city as well, which is a Karst landscape (I learned this term from Fuerst). What this means, in essence, is that stadium construction couldn’t extend far into the ground because of the instability of the earth below. This is why clubhouses and batting cages and storage areas and such are located beyond the outfield. 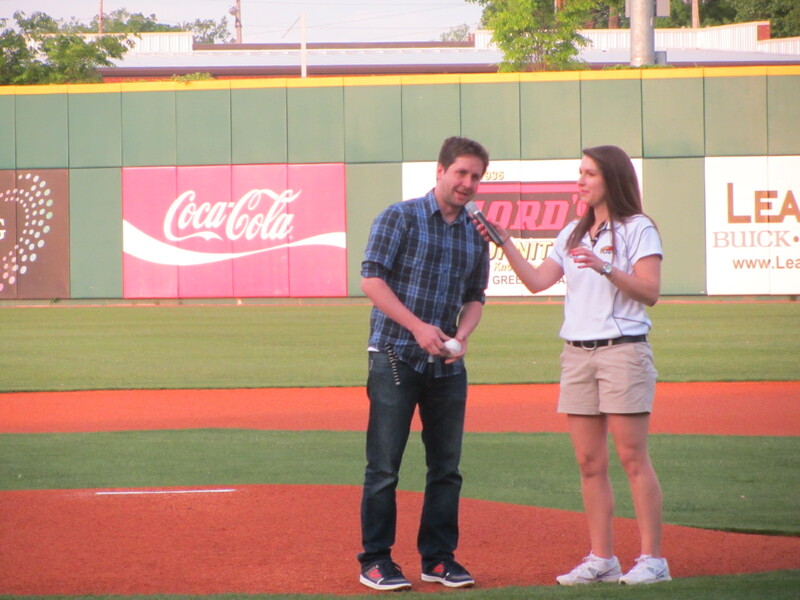 I had been tapped to throw a first pitch, and while waiting for this honor to occur I wandered around the perimeter of the playing field. 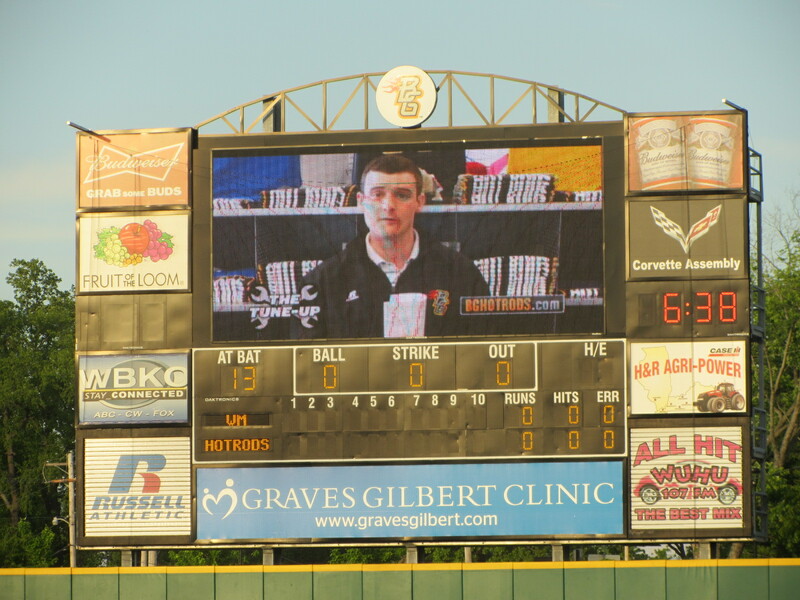 Hank Fuerst, looking sad in this non-representative still, doing the pre-game show on the rather impressive videoboard. Notice that the pre-game show is called “The Tune-Up.” Other team name tie-ins to be found around the stadium include the “Turbo Times” game program and “Body Shop” team store. 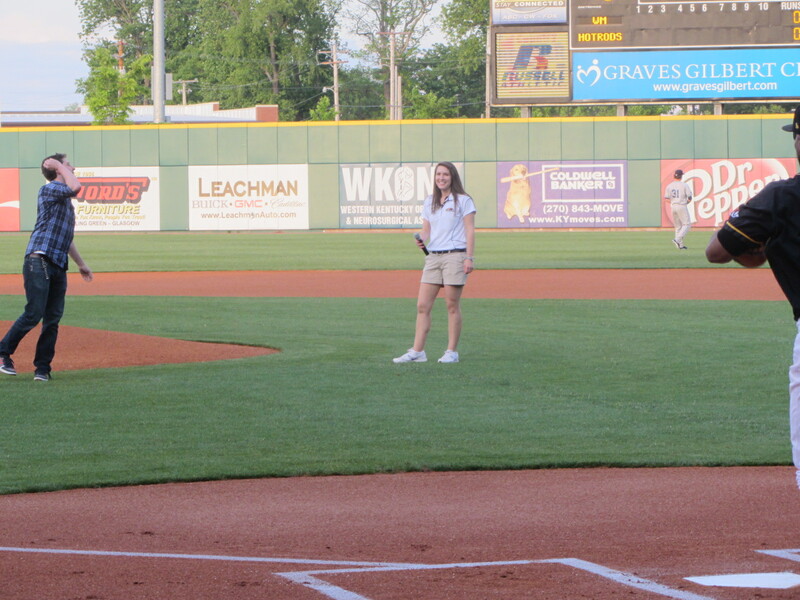 Finally — the first pitch, as overseen by promotions manager Jennifer Johnson. 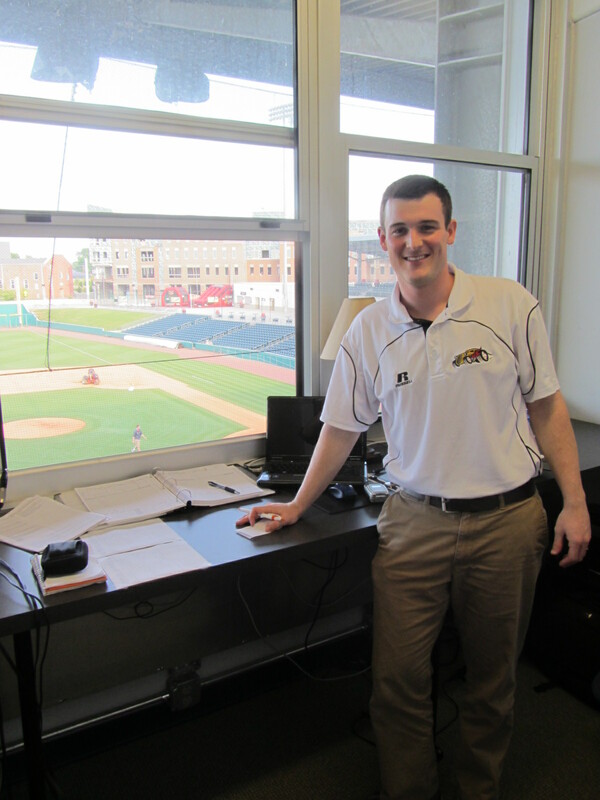 I have delivered quite a few first pitches over the years, but this marked the first occasion in which I was asked to introduce myself (usually, the intros are done over the PA in hyperbolic fashion). While I now wish I had taken the opportunity to tell the crowd that Sparks is the most underrated band of all time, I simply said “Ben Hill, from MinorLeagueBaseball.com” in a tone most stentorian. And, well, let’s just say that it wasn’t one of my better offerings. But mascot love is unconditional, and despite my mechanical failures Axle and Roscoe were their to buoy my spirits. Nonetheless, I thought it would be best to lay low for a bit so I proceeded to the right field corner for the national anthem. And, well, alright! The game was finally underway, and it took me less than 900 words to get to this point in the narrative. Still out in right field, I recorded a Vine video in order to provide a little game day ambiance. I am new to Vine, and Vine is new to the world, so there are kinks to be worked out on all sides. However — it is a fun and easy to use app that I plan on incorporating into my content from now on, and I hope that MLBlogs will soon allow its users to embed these looping six second videos on the blog. In the meantime I will link to them when applicable, and if you follow me on Twitter — @BensBiz — then you’ll have immediate real-time access. 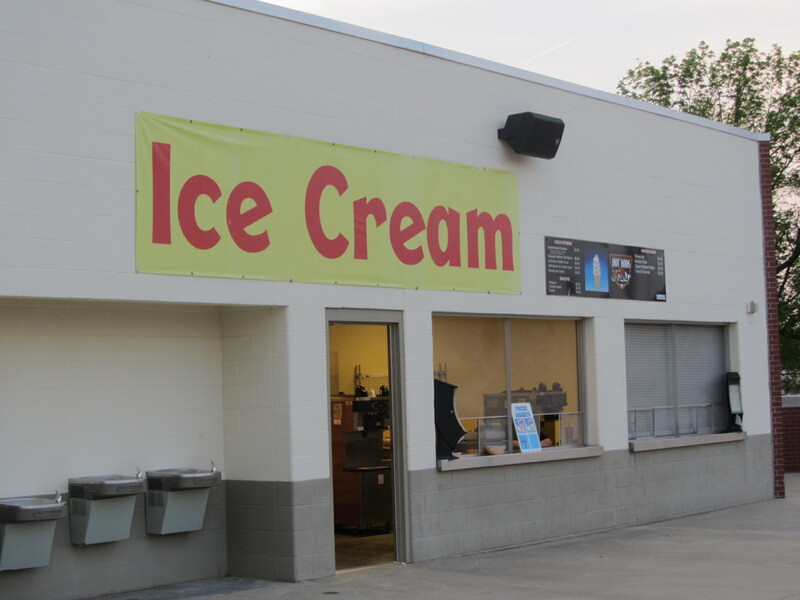 It was a Wednesday night ballgame, the first of the homestand, and the crowd was about par for the course for a mid-week ballgame played during the school year. 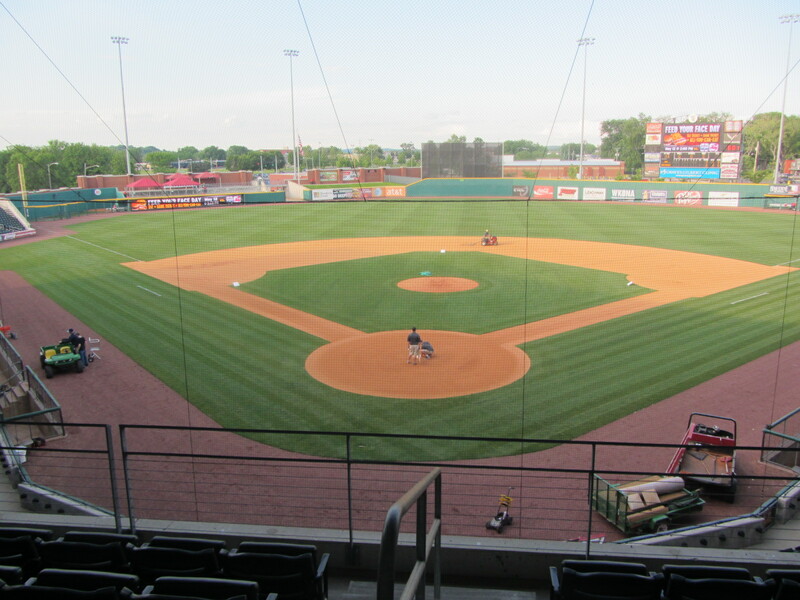 To use a car analogy, since car talk so prevalent here in Bowling Green: the team’s return home represents turning the ignition, and then each game of the homestand represents shifting into a higher gear, and, therefore, this game was first gear and…okay, that’s terrible. Just look at some pictures. That’s all anyone cares about, right? So here you go. Look at these pictures, while I attempt to rally from yet another bout of writerly self-pity. I must have passed this dude five or six times on the concourse. 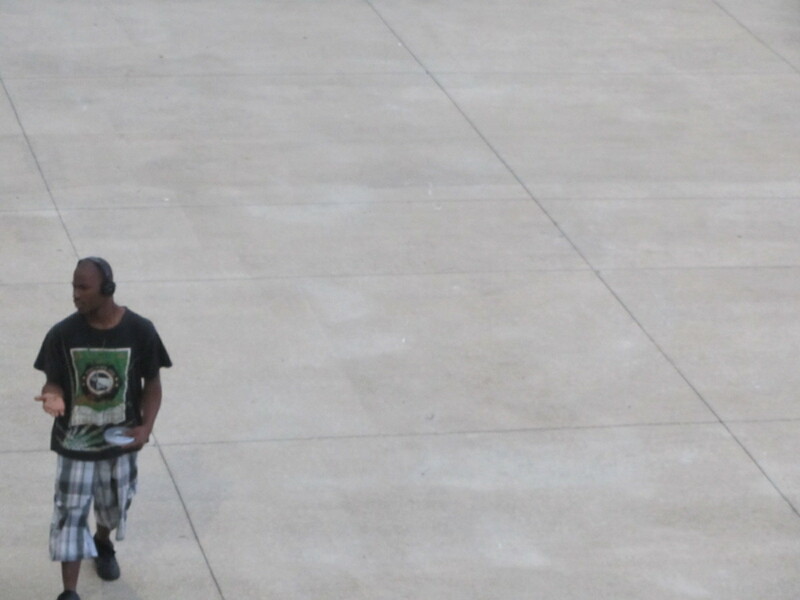 He was always carrying the compact disc player, always engrossed in the music. I wonder what he was listening to. Sandberg, former Tampa Bay Devil Ray and nephew of Ryne, is, so far as I know, the only manager to ever tweet about one of my ballpark visits. Why is that tweet not embedding? Why is it a good idea for me to waste 30 minutes on trying to correct this? Point is, Sandberg’s tweet expressed mock frustration because he “missed out on free food and tix” that the Hot Rods were offering to my designated eater that evening. 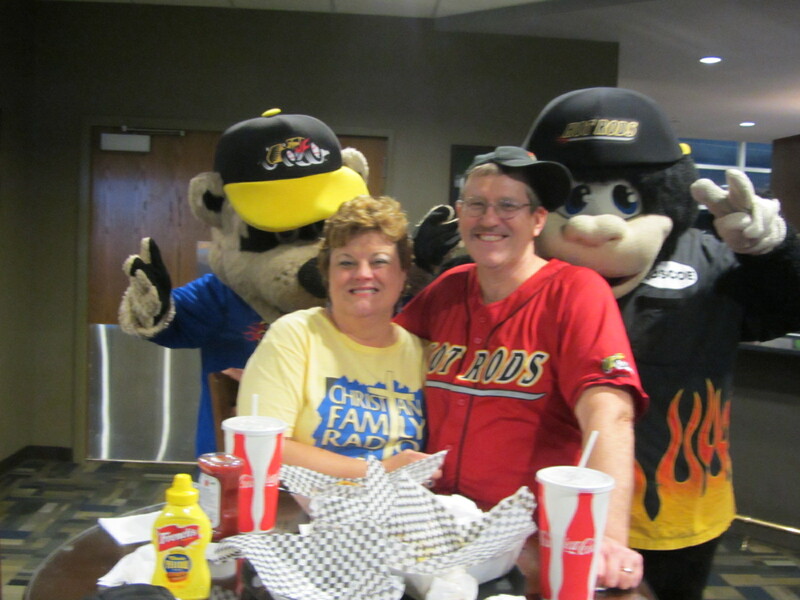 The Hot Rods held a contest on their Facebook page to find Wednesday’s designated eater and selected season-ticket holders Randy and Donna Brown. 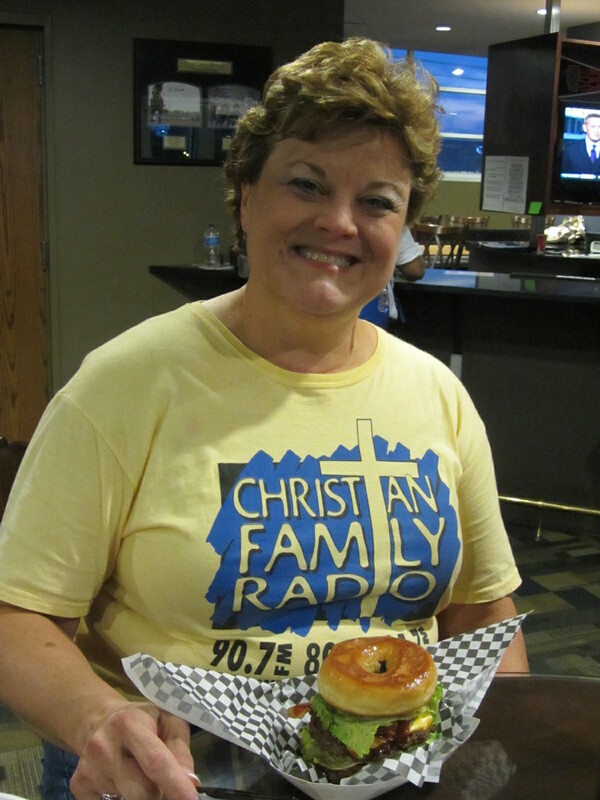 The Browns have been married for 34 years — he’s a maintenance worker at a local factory and she an office manager at Christian Family Radio — and their relationship dates back to their late teenage years. At that time, Donna worked at Wendy’s and Randy at a steak restaurant. “It was the best of both worlds, and we haven’t slowed down since!” said Donna of their employment situations at the time. Clearly, these were the right people for the job. 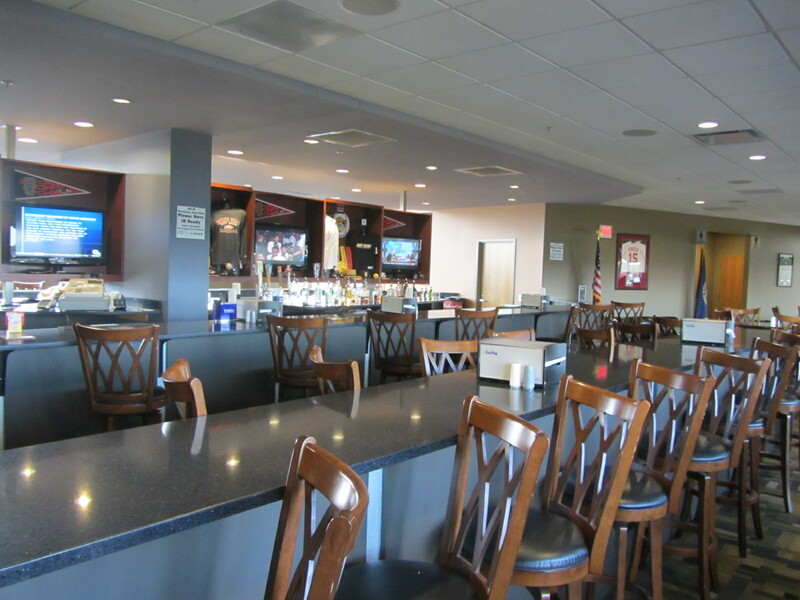 Sitting in the Stadium Club bar and lounge area, located on the second level behind home plate, Randy and Donna were soon presented with BBQ Pork Nachos and, more significantly, the Grand Slam Burger. My thanks to the Browns, who were both very good-natured and engaging and got this whole ridiculous “designated eater” concept off to a great start. At this point, the night was upon us. 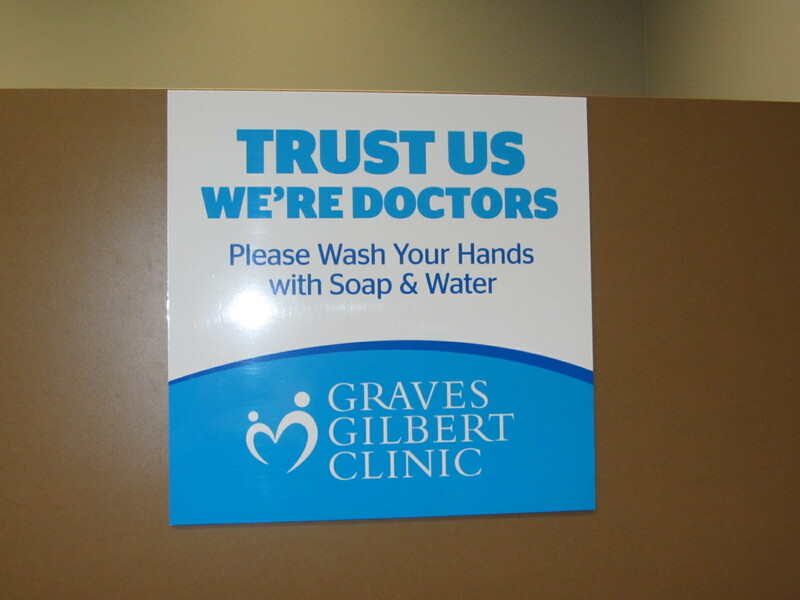 After a brief stop in the restroom — always wash your hands! 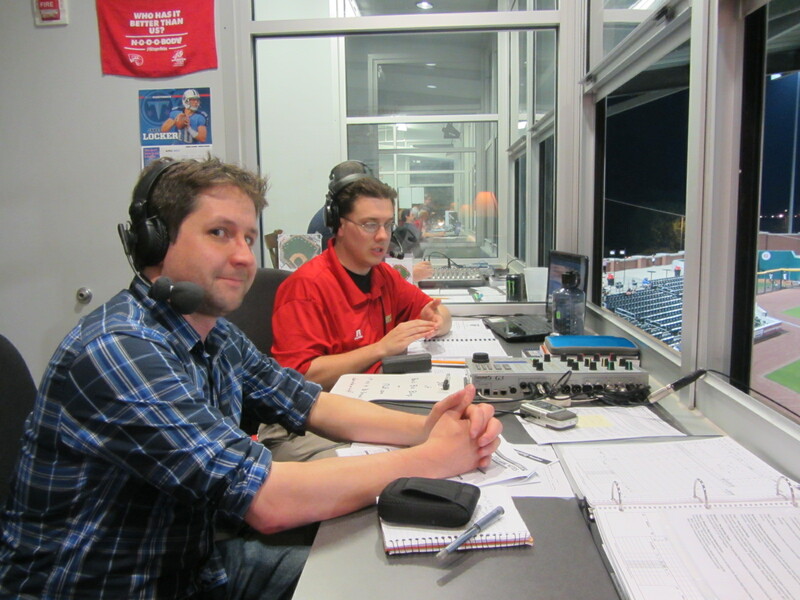 — I headed over to the radio booth for an inning with number two broadcaster Chris Kleinhans-Schulz. My puns were quite plentiful, my insight quite lacking. Hey, look, you’ve all come to see pictures and instead I’ve written over 1500 words, all of them gratuitous. 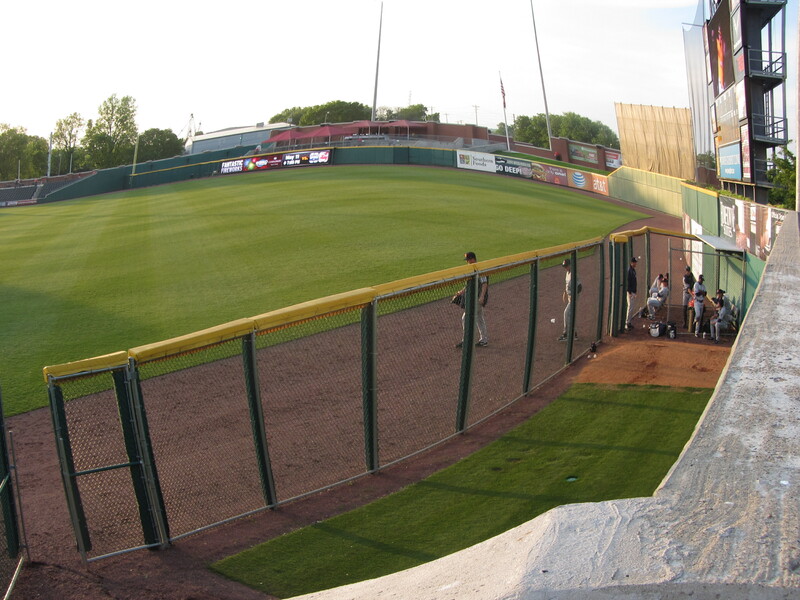 Time to shut it down, similar to how the Hot Rods were shut down by the visiting Whitecaps. 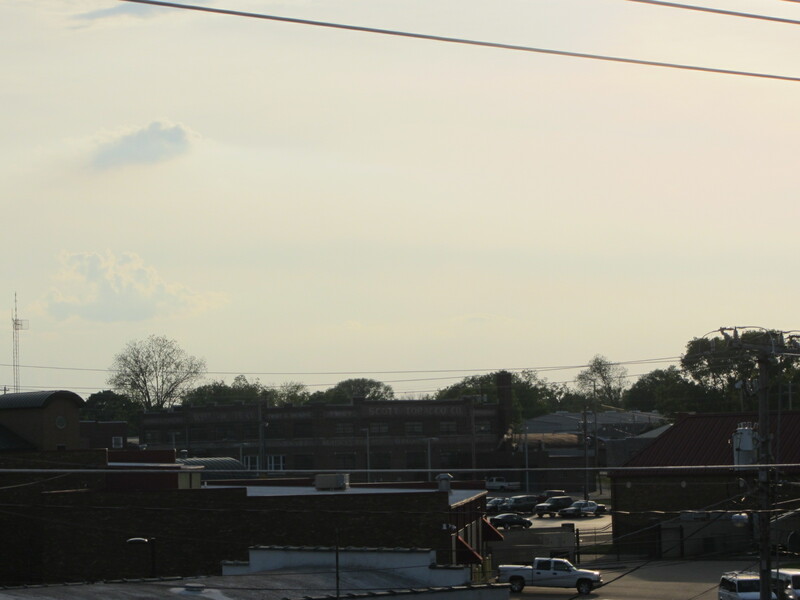 Wednesday night being what it is, I didn’t catch Bowling Green Ballpark in its full splendor. But this is a great front office operating in a great stadium in what seems to be a great town. I certainly enjoyed my time here and, apropos of nothing, on the way out noticed this really awesome looking advertisement. Like any self-obsessed writer, I regularly check to see what websites have recently linked to my blog. Most of the time it’s random message board posters with an affinity for giant hamburgers, but occasionally the results are more interesting. I would bring a monster truck to my stadium/arena and it would go flying off a ramp. It would have to jump 6 school buses lined up next to each other. There would also be a huge ring of fire right in front of the ramp to make everything look crazy. The monster truck would have my team’s logo on it. It would be crazy and the place would be sold out. Seeing that people will pay to watch risky situations. 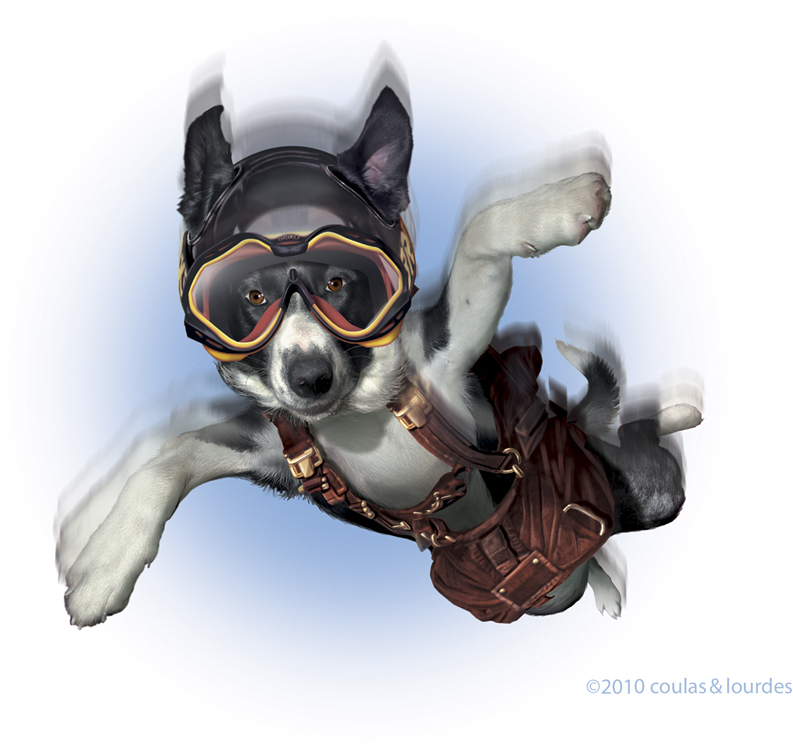 I would promote a pet skydiving. I would let dogs/cats land in the middle of the field before the game. 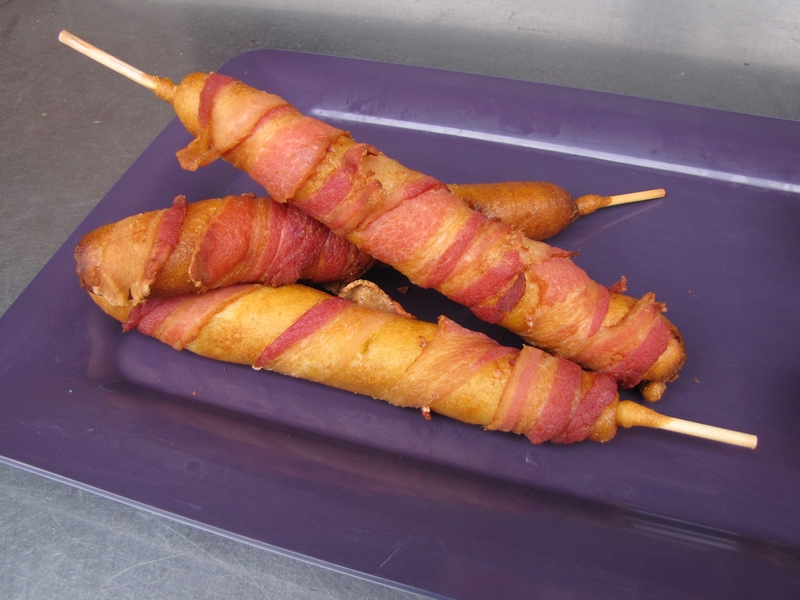 This will honor animal abuse and will also bring fans to the stadium. My idea would be to have player vs fan game. When the fans buy a ticket for the game they have a chance to enter contests. Then the fans will be picked at random to play a mini game with the players. I think if you give the players a chance to interact with the players it will attract more people. I think it’s great that teachers are introducing such sports marketing concepts to high school students, as it could potentially get them interested in a Minor League Baseball career. 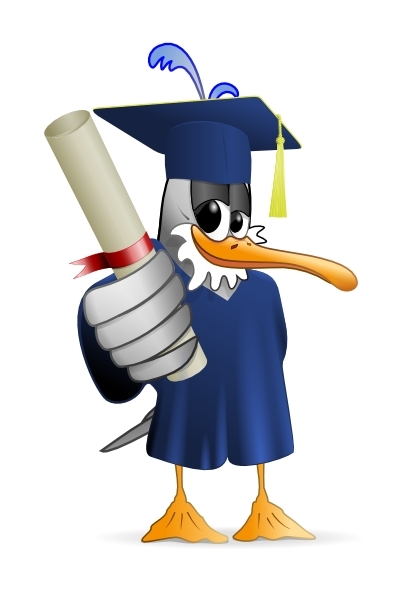 To any high school teachers or college professors who read this blog — I will gladly assist your educational endeavors. Get in touch anytime. And even more beneficial would be for teams to get involved. Wouldn’t it be great to invite students to the ballpark to take part in the conception and execution of a Minor League promo? While animal skydiving is probably not going to happen any time soon, it would be very interesting to see students’ ideas incorporated into gameday entertainment. Just a thought. I’ve been known to have those once in a while. 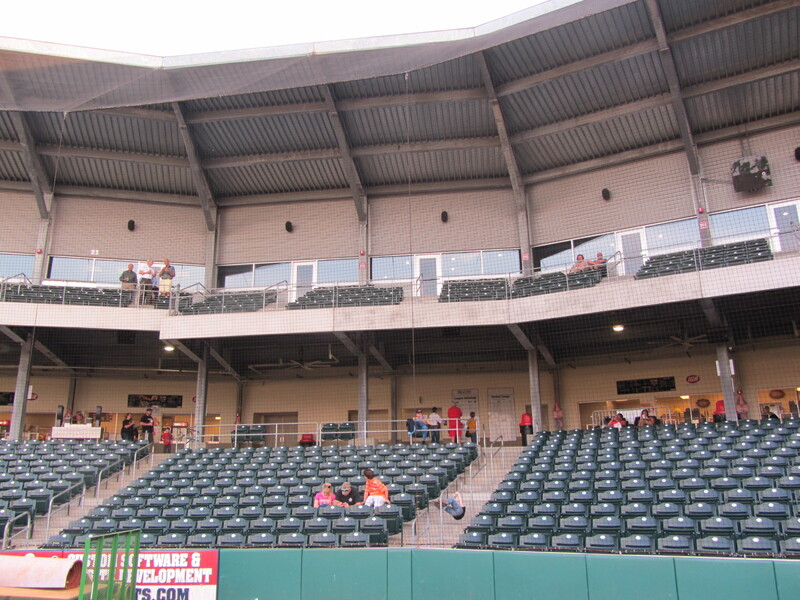 And young promo progenitors would be more likely to come up with social media innovations, such as the Bowling Green Hot Rods’ Facebook Fan Night. 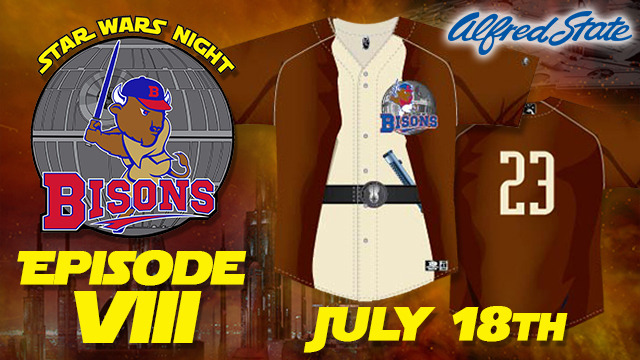 This first-of-its kind promo is rolling right along — Facebook fans have selected the game time (6:35) and are now in the midst of picking the uniforms the team will wear that night. And, predictably, the idea is catching on. 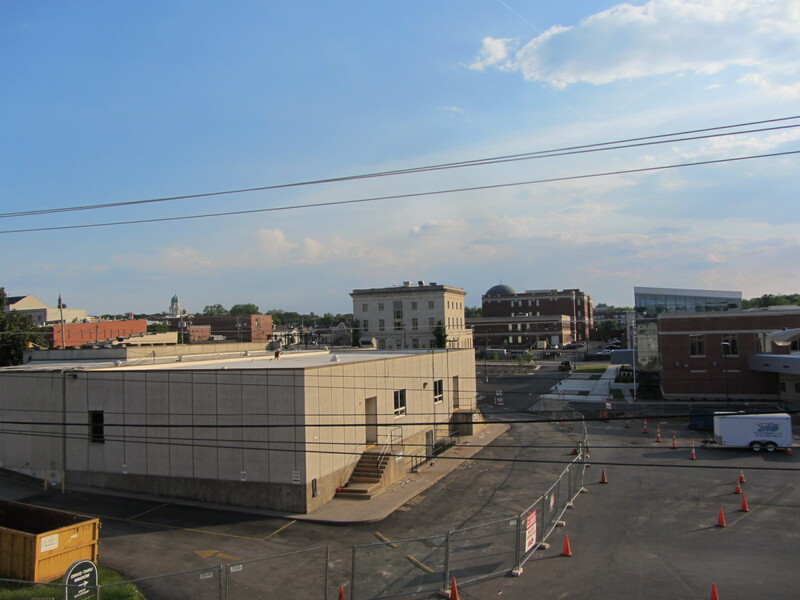 Kane County and Stockton have recently announced their own version of the promo. Who’s next? Double Feature! 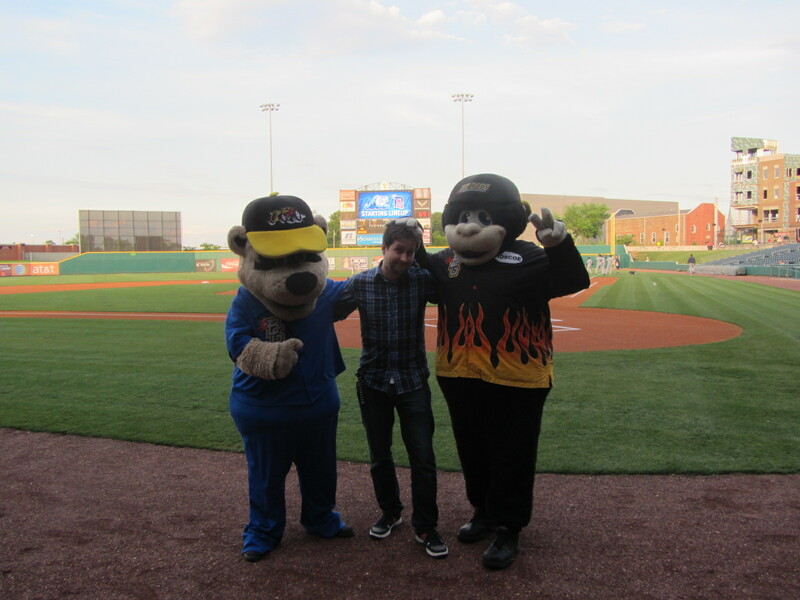 RiverDogs and Hot Rods! Since I didn’t post yesterday, and because we are entering a particularly “newsy” time of year, today will be devoted to TWO headline-worthy items. 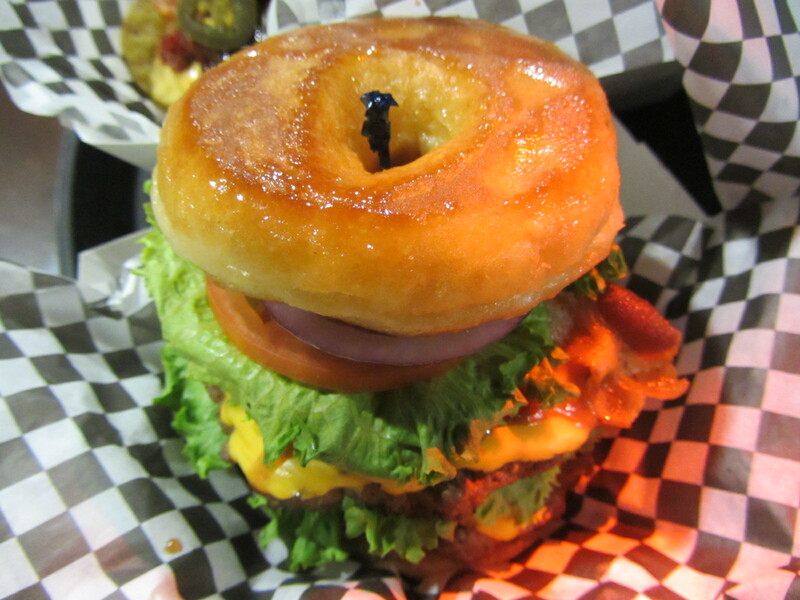 Let’s start with — you guessed it – food. Speaking of embraces, the Bowling Green Hot Rods are embracing Facebook at a heretofore unheard of level. 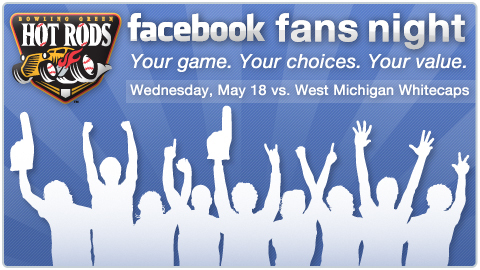 May 18 will be “Facebook Fans” night, an evening devoted to the mercurial whims of the team’s passionate social networking partisans. [T]he initial step of the promotion drives the team’s Facebook fans to recruit new members to add to its following…..Until April 18, for every 200 additional fans that ‘Like’ the team on Facebook (up to 10,000), the Hot Rods will reduce ticket prices by 50 cents for all of its Facebook fans on May 18. This means for every 1,000 new fans beyond the current 7,000, box seat ticket prices drop $2.50 from their face value of $10. Starting next Monday and continuing every week through the beginning of the season, the team begins phase two of the promotion. 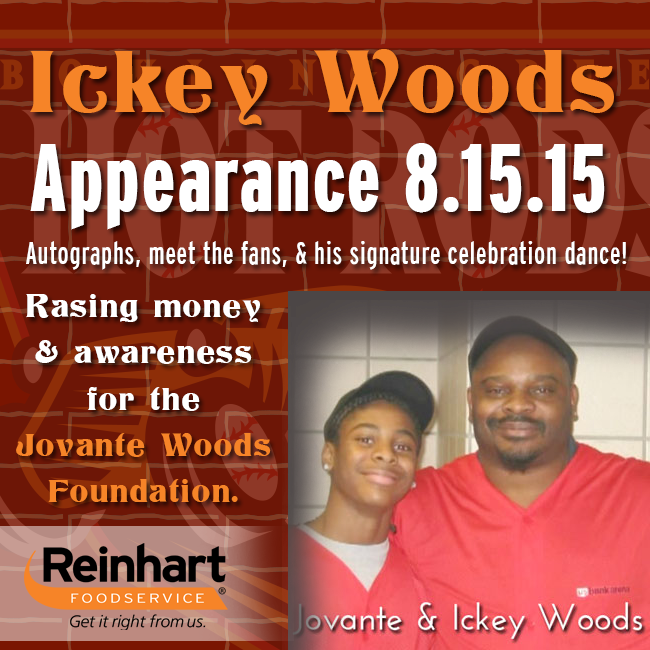 Each week a new element…will be posted on the team’s Facebook page for fans to vote on. 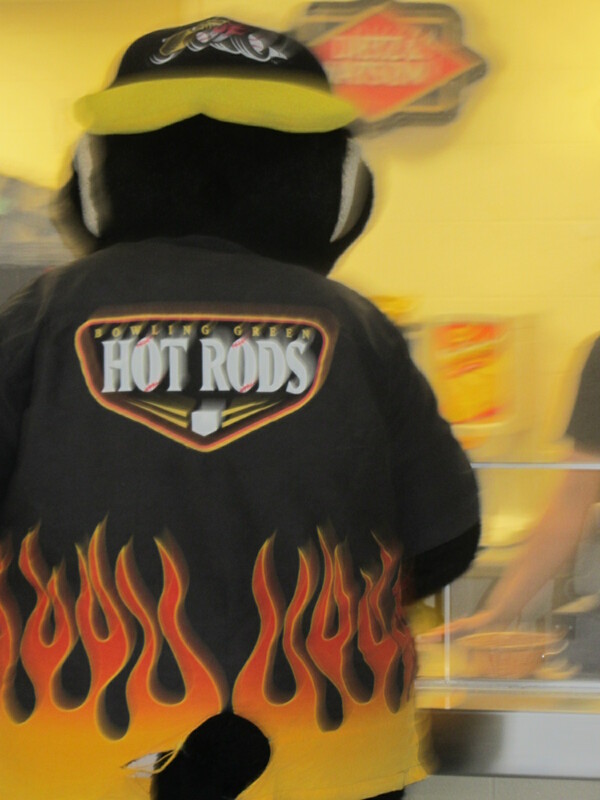 The first element on February 21 will have fans select what time the game starts…Additional elements include which uniforms the Hot Rods will wear and what food and merchandise items will be specially priced for the game…Hot Rods Facebook fans will also be incorporated into several game day activities ranging from on-field promotions, first pitch opportunities, and meetings with Hot Rods players and coaches. Like a serialized novella, this is going to take a long time to play out. You can count on me for periodic updates and observations, as it should be quite interesting to see this one develop. 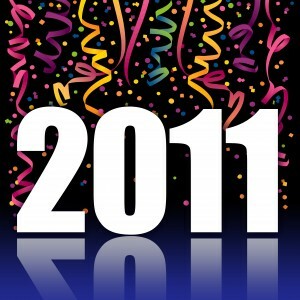 I would like to begin 2011 by employing my favorite kind of metaphor — a belabored one. 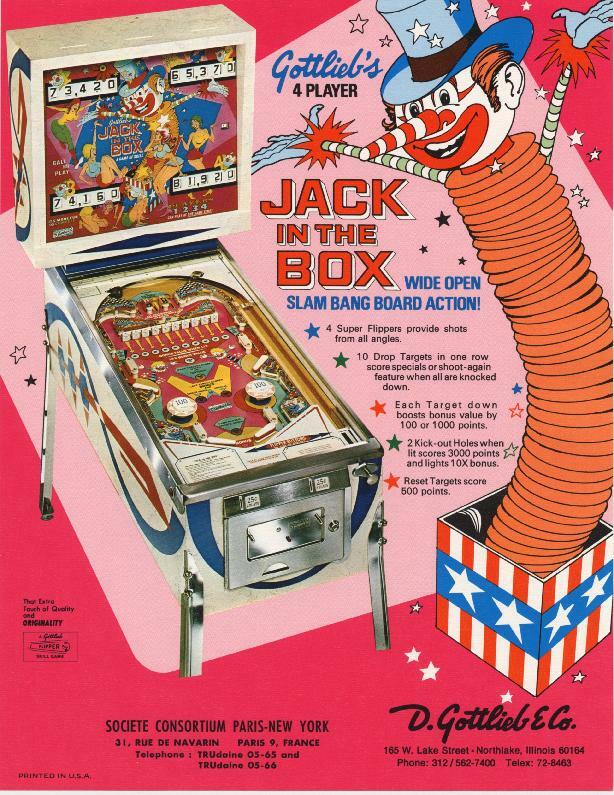 Over the next three months, Minor League Baseball teams will be turning the lever on the jack-in-the-box that is their operation. They will do this, with increasing speed and intensity, until the cadence of the calliope reaches a fever pitch. And then — BAM! — out pops the 2011 season. From that point forward (assume determined, gravelly tone): It’s On! But let’s not get ahead of ourselves. The gears are turning rather slowly right now, but as long as they’re moving I’ve got something to write about. 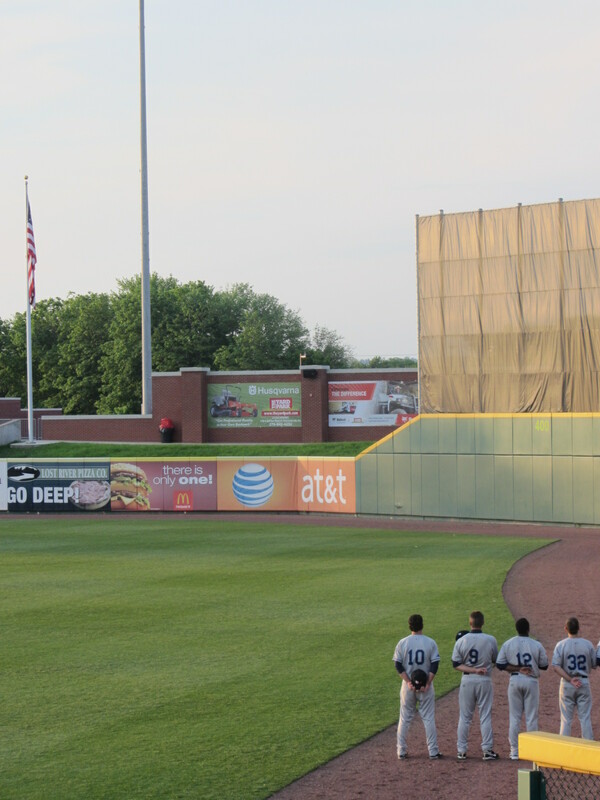 Let’s start with some news that came out of Trenton this morning, as the ever-reliable Thunder have announced a promotion that has an obsessive, Rainman-like numbers fixation. number one‘s historical day. 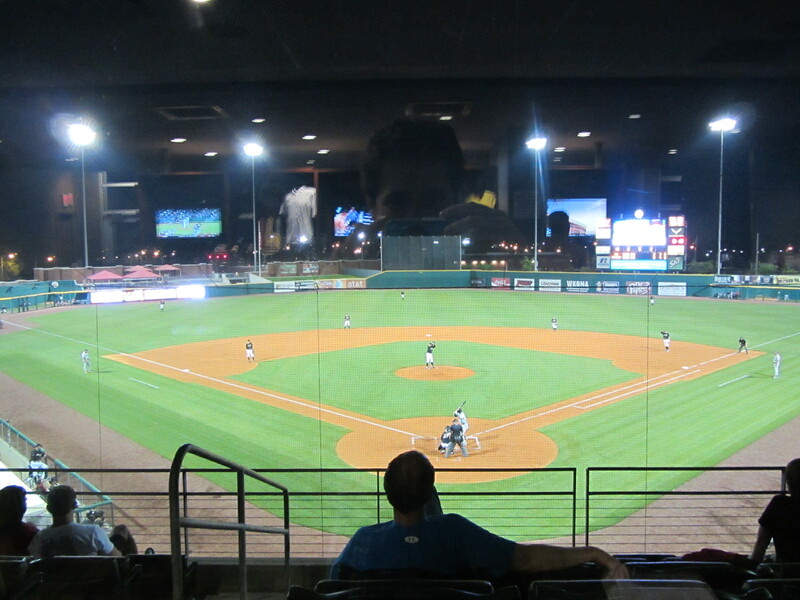 The team selected their number one value-driven promotional game on the 2011 schedule and will have an early one-day release for individual tickets to that exclusive game. 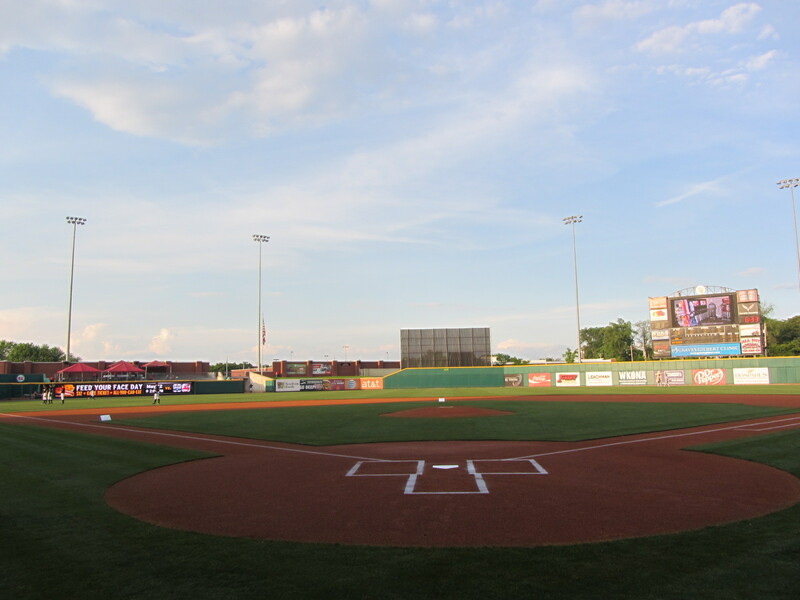 On Tuesday, January 11th the Thunder will open up 1,111 tickets for their Friday, April 15th game against the Harrisburg Senators (Washington Nationals). On the 15th, for the advanced ticket price of $11, fans can enjoy free Hot Dogs, Hamburgers and Cheeseburgers throughout the game. But the Thunder aren’t the only 1 doing a special 2011-based ticket offer. Down in Fort Myers, the Miracle have their own ideas on how to commemorate time’s inexorable passage. The Miracle are pleased to present the “Miracle NewYear’s Resolution Pack”. PLUS a 4-pack of Miracle tickets — all yours for the New Year’s price of $20.11. It should go without saying, but this stupendous offer is only available through 1/11/11 at 11 a.m. (come on guys, I think you should extend the deadline to 11:11). 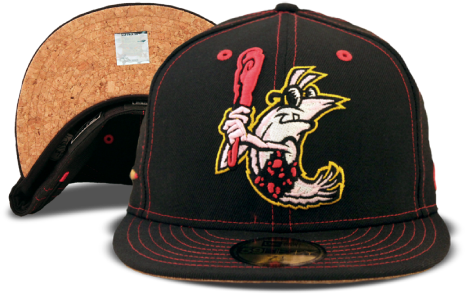 Moving on to less numerically-based news, I’d like to focus your attention on a quite-awesome piece of ultra-limited Minor League apparel: The Bowling Green Cave Shrimp Hat, designed by the taste-making impresarios over at Plan B Branding. 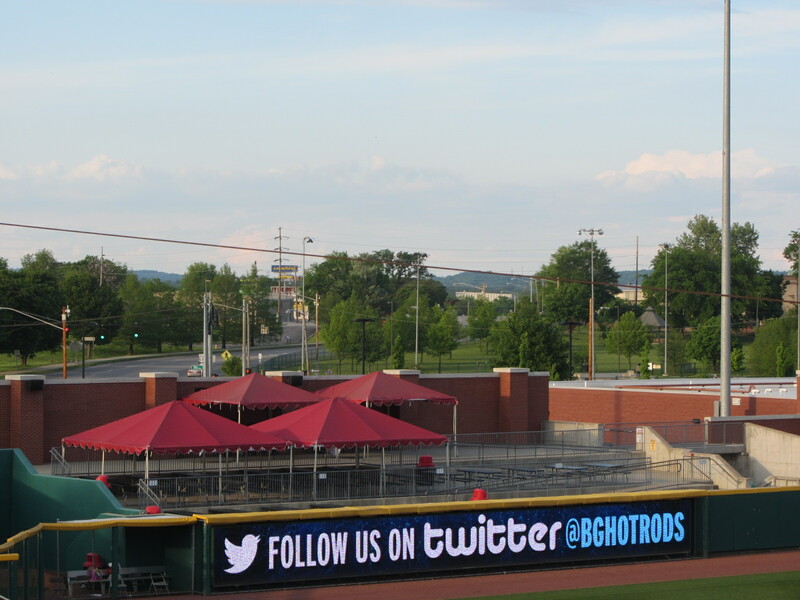 As regular readers of this blog know, this iconic sightless crustacean has already been celebrated in a series of reality-bending game day promotions staged by the Bowling Green Hot Rods. May the power of the cave shrimp only continue to grow.